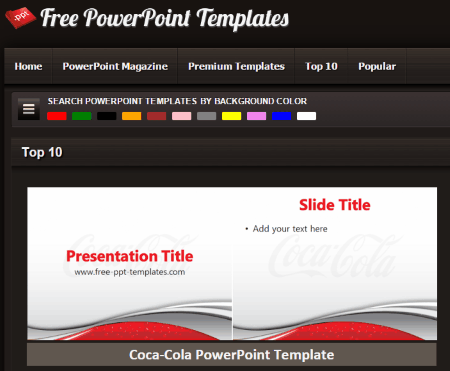 Here is a list of the best free websites to download free PowerPoint templates. These are quite basic, and easy to use. 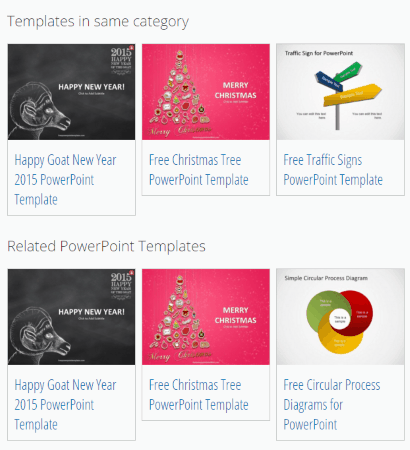 These contain a number of categories of PowerPoint templates, like: education, business, organization, Christmas, New Year, Halloween, and many more. Some of these websites are specifically designed to provide a particular category of templates, like: Law, Medicine, Business, and so on. You can also choose the option to sort the templates based on colors, tags, and many more. 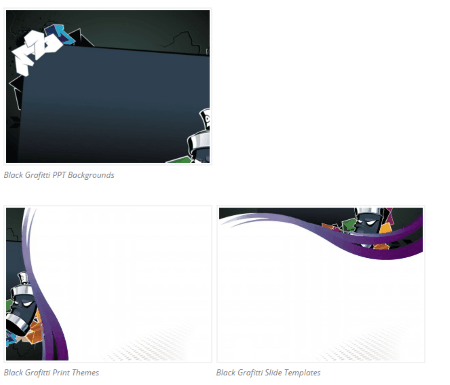 These templates can be used in any PowerPoint application. Some of them also come along with the bundled images which can be used whenever required. The templates are available in different display format so as to suit your required needs. 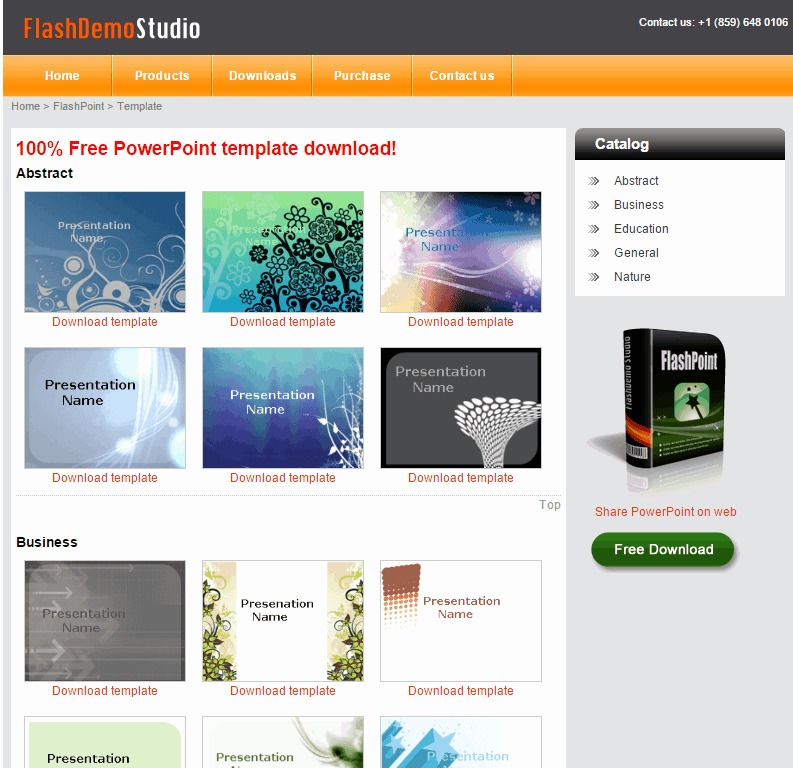 The Best free PowerPoint template downloader website that I like the most is SlideModel.com. 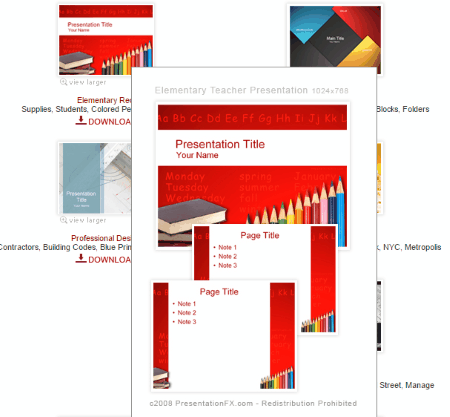 It is due to the fact that it provides a number of beautiful templates, and the most important fact is that you can use the templates in Google Slides, and can also download it to be used offline on PCs. You can also check out the list of PPTX Viewer Software, PowerPoint To PDF Converter, and Convert PowerPoint To PDF. 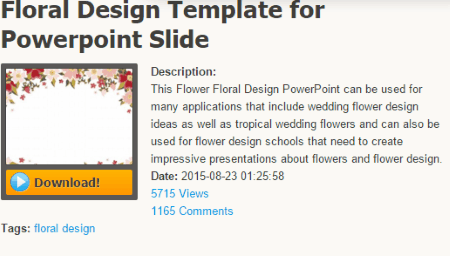 SlideModel.com is a very simple website which features a number of PowerPoint templates. Here you have to register into the website first, and then login in order to download the template. Else it can be opened in Google Slides. 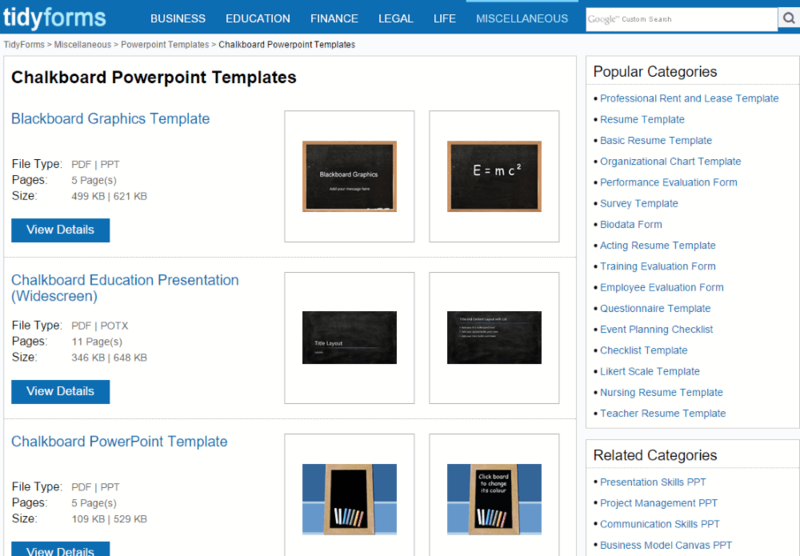 Different categories of the PowerPoint templates are available to choose from, like: business, data and charts, diagrams, maps, pictures, shapes, template backgrounds, text and tables, and timelines and planning. 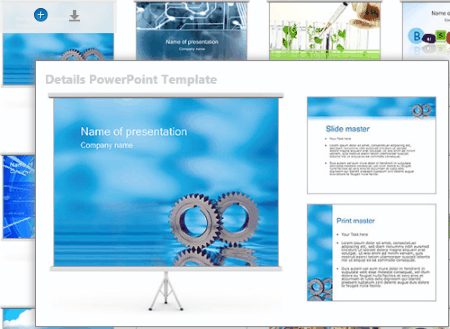 You can choose the option to download the best PowerPoint templates, latest PowerPoint templates, business PowerPoint templates, strategy PowerPoint templates, marketing PowerPoint templates, and SWOT PowerPoint templates. 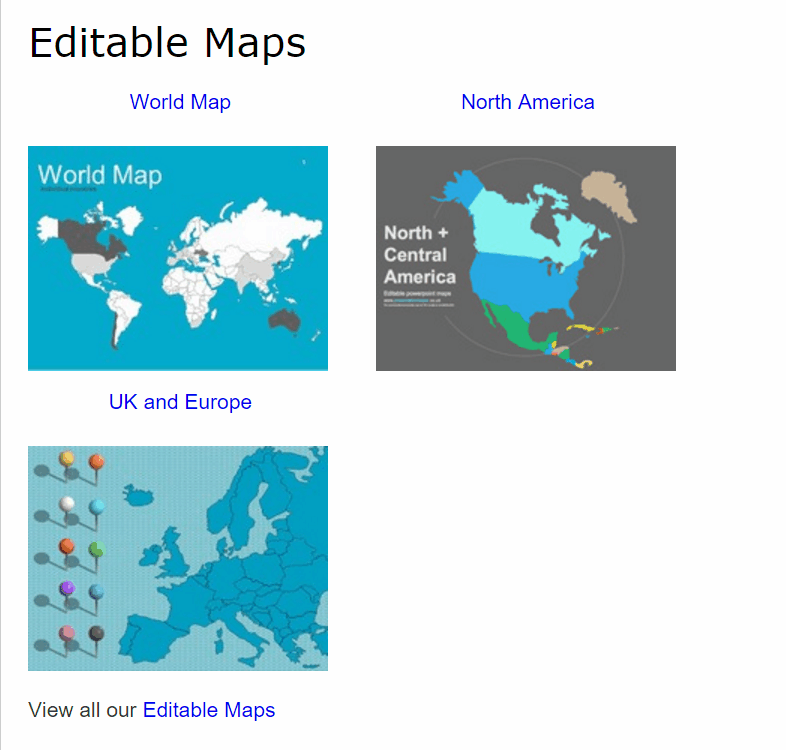 You are also provided with the option to download the maps PowerPoint templates. 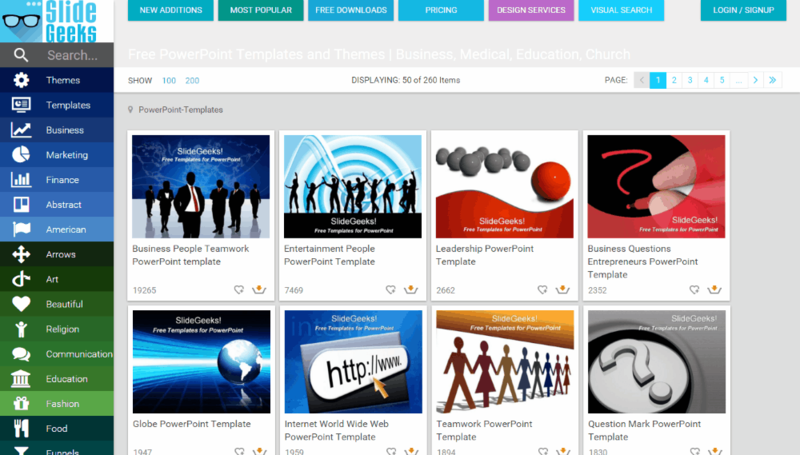 You can also download PowerPoint diagrams, PowerPoint shapes, data and charts, and text and tables. You can also sort the items based on Popularity, newest, and title. SmileTemplates is a sleek looking website with a large collection of cool PowerPoint templates, out of which some of the PowerPoint presentation templates are free. 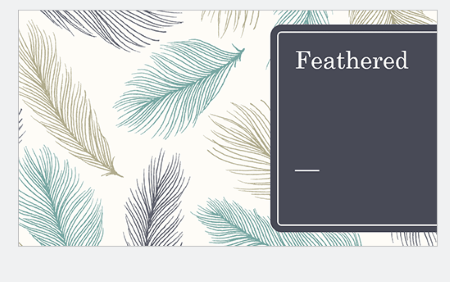 Hovering over the template displays you the a preview of the template. Click on the template that suits you the best. 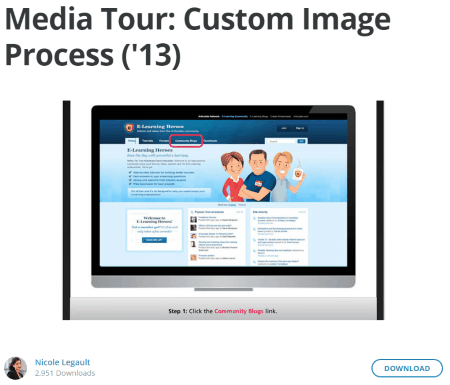 Then you are displayed with the images of the template, keywords, and a small description. 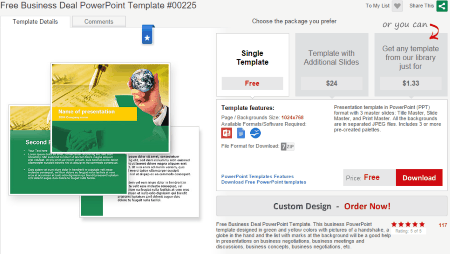 Then you are given two choices to download either the free version with lesser number of slides, or buy the PowerPoint template with more number of slides. You can also choose to view similar products if required. You can also browse for the templates based on categories. 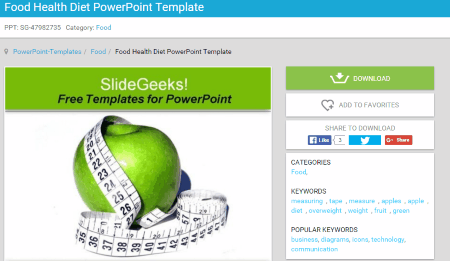 Slide Geeks is a simple website from where you can download a number of templates for free. Here you have to firstly register into the website, and then browse the template that you wish to download. Then you have to share the template link on Facebook, Twitter, or Google+ in order to activate the download link. After the download link is activated, the file is available for download. Templates of different categories are available, like business, medical, education, church, marketing, finance, abstract, american, art, beautiful, religion, communication, and many more. 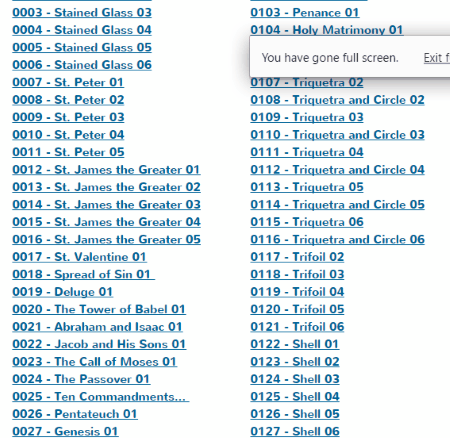 You can also browse based on new additions, most popular, free downloads, and many more. 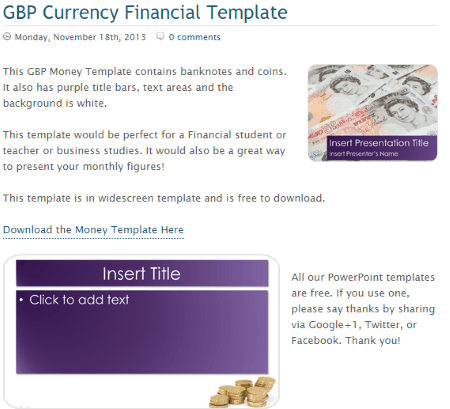 PPTTemplate.net is a simple website which provides you the option to download free PowerPoint templates. In order to do so you have to register to the website first, and then login. Then browse to the template that you want to download. The template are classified in different categories, like: abstract, animal, animated, background, business, Christmas, education, fashion, food, Halloween, lifestyle, medical, music, nature, office, people, professional, religious, season and holidays, sports, technology, thanksgiving, and many more. You can also browse for the templates by making use of tags. 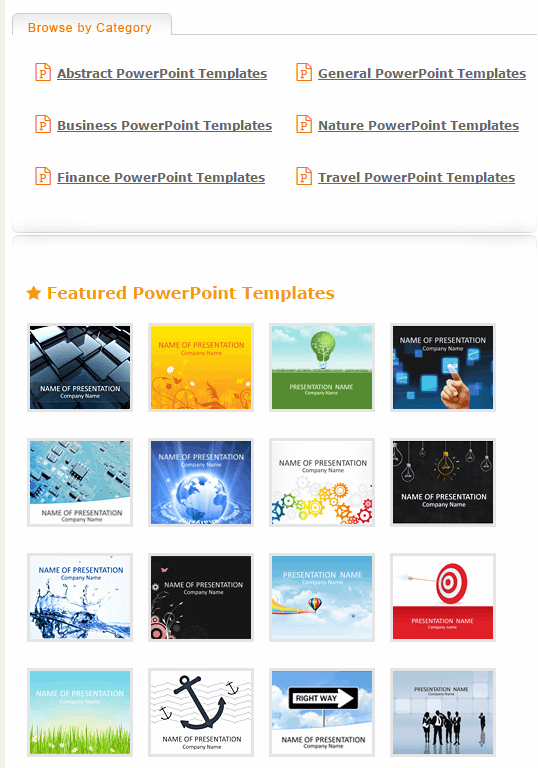 You can also select from the best PowerPoint templates, top PowerPoint templates, and business PowerPoint templates. 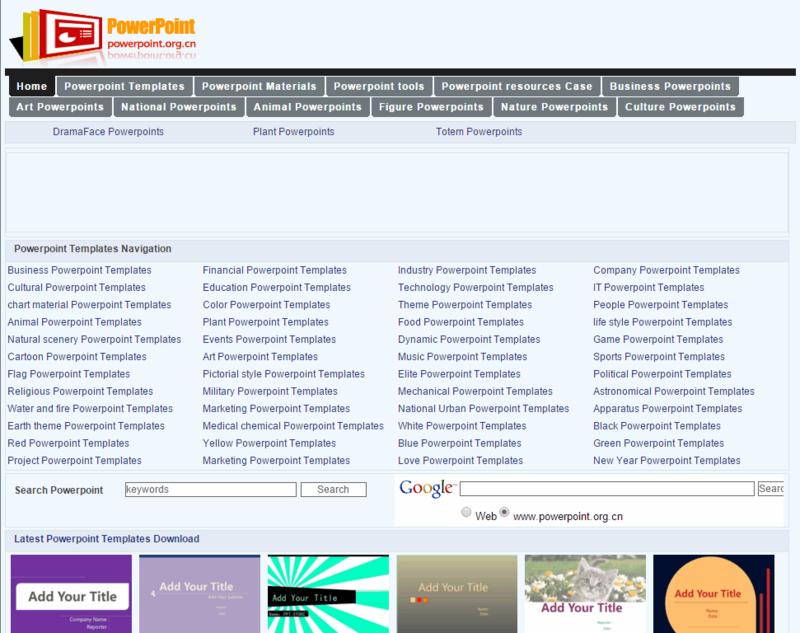 tidyforms is another website for Free Powerpoint Templates. In order to download the template you have to choose the option to view details, click on download button, and then after entering the verification code, you can download the file. The templates are classified under different categories, like: Professional Rent and Lease, Resume, Basic Resume, Organizational Chart, Survey Template, Bio data Form, Acting Resume, Questionnaire, Event Planning Checklist, Checklist Template, Nursing, Teacher Resume, Cool, Professional, Poster, Game, Christmas, Animated, Medical, Christian, Modern, Halloween, Education, Teachers, Music, Simple, and many more. 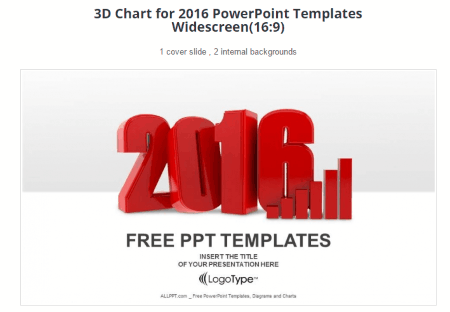 Free PPT Files is a very simple website that offers a lot of beautiful looking PowerPoint templates for free. Here you have to simply choose the template that you wish to download, and click on the download button. You can browse the New templates, top templates, categories, and tags tabs so as to find the template best suited for your needs. You can also sort it based on colors. 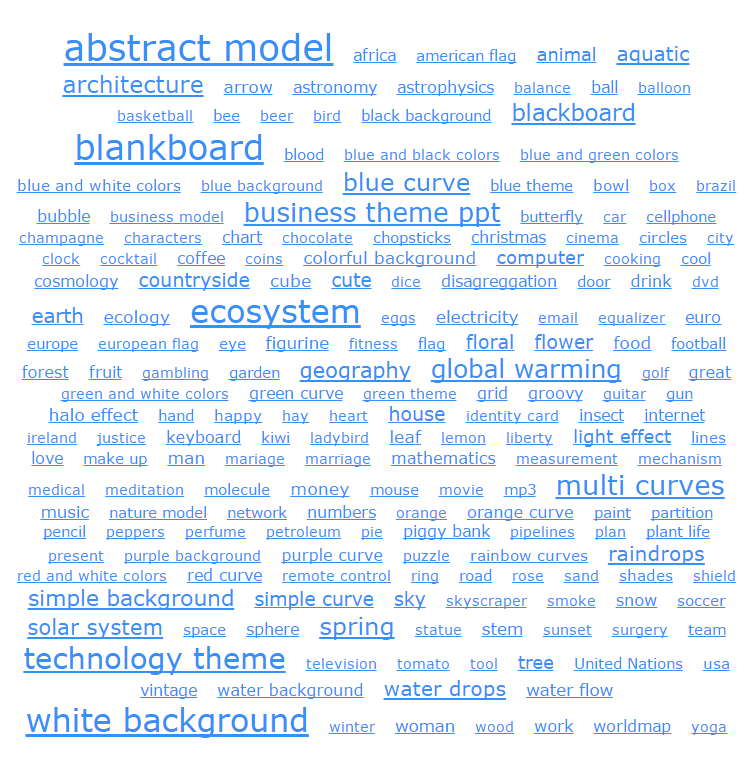 Different categories of the template include abstract and textures, buildings and architecture, business, food and drink, general, international, law and legislation, nature, social, sports, games, music, technology and computers, telecommunication, and welfare. 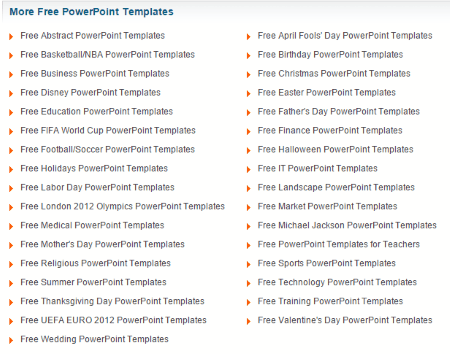 powerpoint.org.cn is a basic website that offers numerous free PowerPoint templates to download. Here you have to simply select the template, and then choose the option to download it. The templates are organized in various categories, like: business, financial, industry, company, cultural, education, technology, IT, chart material, people, animal, plant, food, life style, natural scenery, events, dynamic, game, cartoon, art, music, sports, flag, pictorial style, elite, political, religious, military, mechanical, astronomical, water and fire, marketing, national, urban, apparatus, earth, medical, chemical, project, marketing, love, and new year. 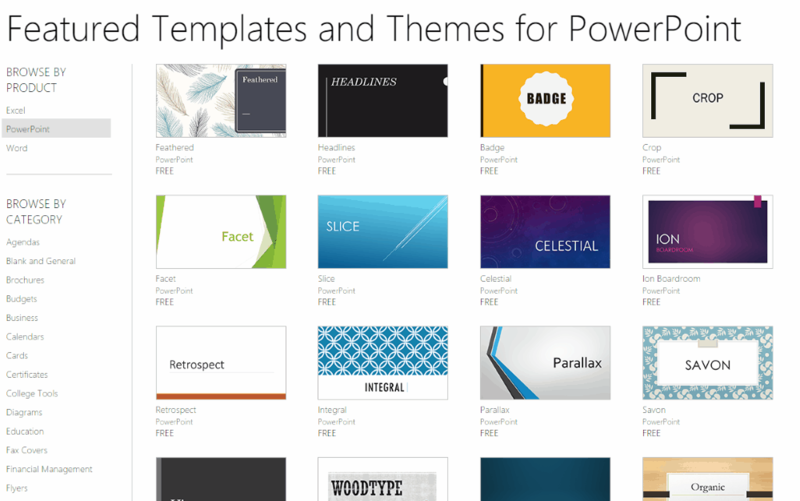 You can also search for some other PowerPoint materials, tools, resources, and many more. 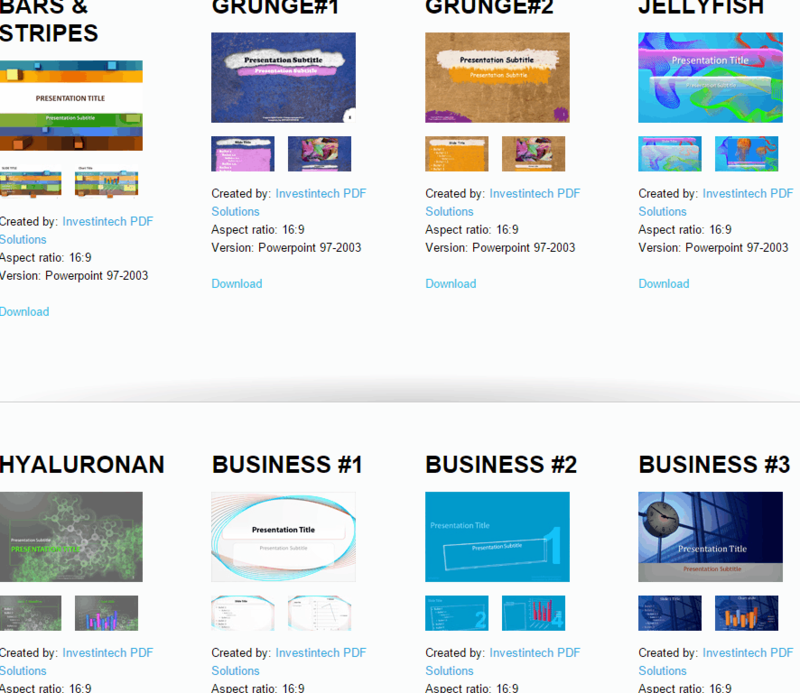 Free PPT Backgrounds is a very simple website, which lets you download numerous PowerPoint templates for free. You just have to browse to the website, and then select the template that you require. The templates are classified in different categories, like: 3D graphics, abstract, animals and wildlife, arts, beauty and fashion, border and frames, buildings and landmarks, business and finance, car and transportation, Christmas, editorial, education, flags, flowers, food and drink, healthcare and medical, holidays, industrial, love, music, nature, objects, pattern, religious, science, sports, technologies, and textures. You can browse it based on colors, and tags. 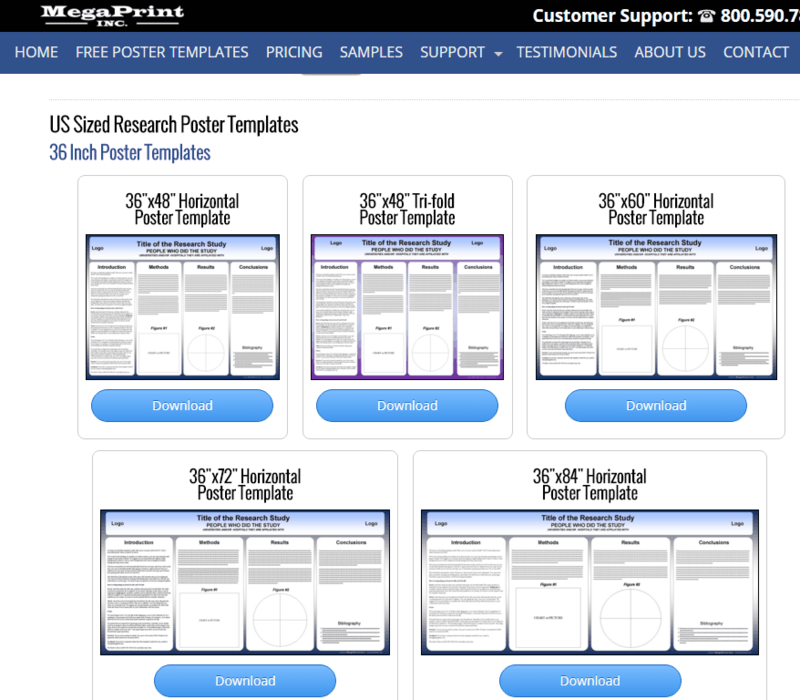 MegaPrint INC. is a simple website that offers to print scientific research posters. 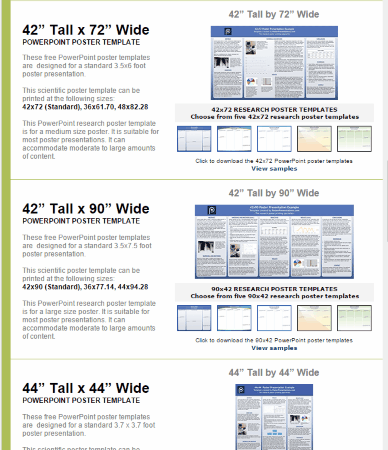 You can also download PowerPoint templates for the posters for free from here. These are available in different sizes. 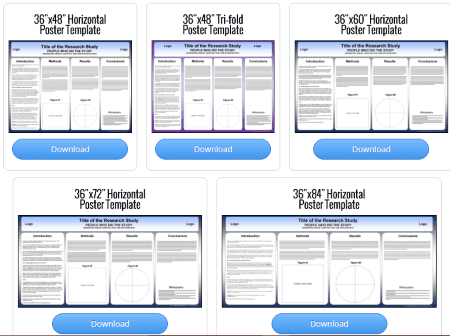 Some of the most common sizes are 36"x48" Horizontal Poster Template, 36"x48" Tri-fold, 36"x60" Horizontal, 36"x72" Horizontal, 36"x84" Horizontal, 36"x48" Vertical, 36"x60" Vertical, 42"x60" Horizontal, 42"x72" Horizontal, 42"x90" Horizontal, 48"x48" Square, 48"x72" Horizontal, 48"x96" Horizontal, 90x80 cm Horizontal, 100x70 cm Horizontal, 140x100 cm Horizontal, 180x90 cm Horizontal, 70x100 cm Vertical, 100x140 cm Vertical, 80x90 cm Vertical, 90x180 cm Vertical, and A0 85x120 cm Vertical. 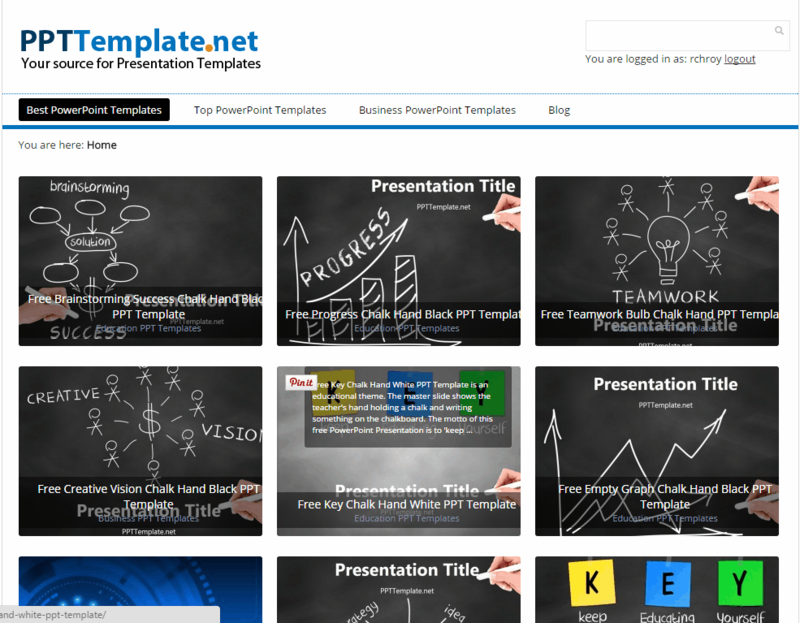 PRESENTATIONLOAD is a good website that along with selling the premium templates also offers a number of free ppt templates that may be used as and when required. 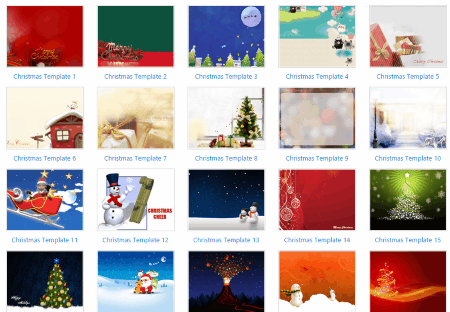 You can also download free PowerPoint quotes template, and free PowerPoint Christmas templates. 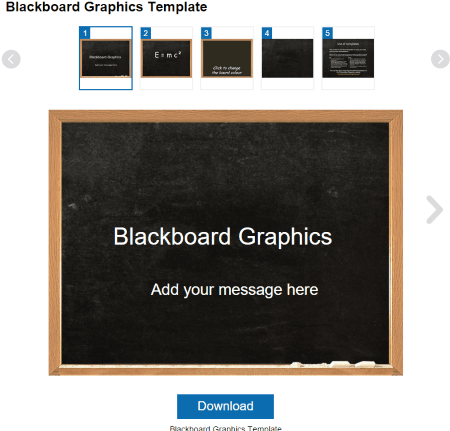 In order to download the templates, firstly you have to register into the website, and add the templates to the cart. 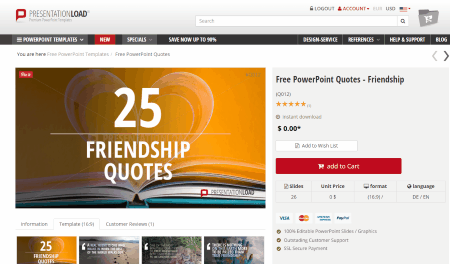 If the cart is filled with free templates, then at the checkout you are provided with the option to download the templates, else it is provided after you make the payment. 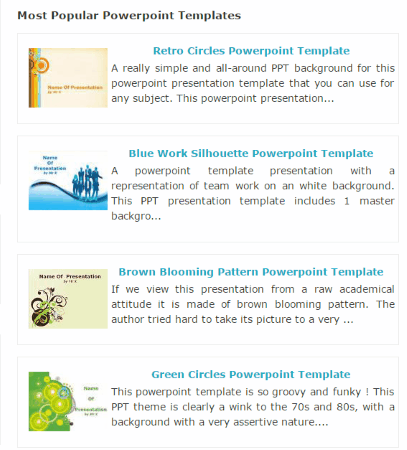 Free PowerPoint Templates is a simple and beautiful website, that offers a number of free PowerPoint templates. There are a number of template categories to choose from, which include: abstract, architecture, brands and companies, business, countries, education, food and drink, games, holidays, music, medicine, nature, social, sport, technology, textures, travels, TV shows and movie, and uncategorized. You can also preview the template before downloading it. 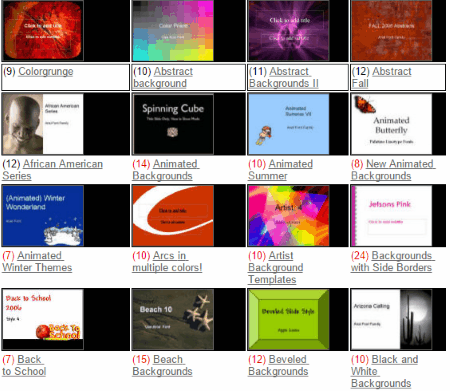 You can also search for the PowerPoint templates by background color. 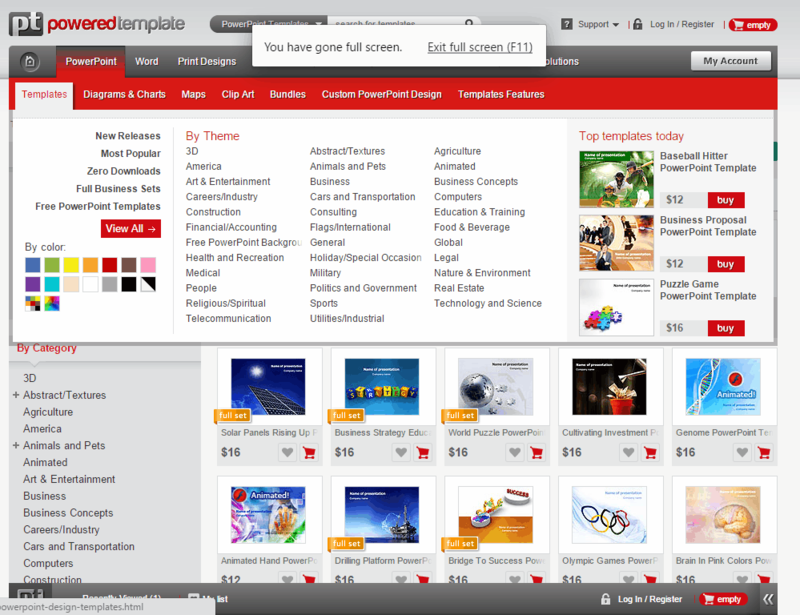 It also features a list of the top 10 templates, and the most popular templates. 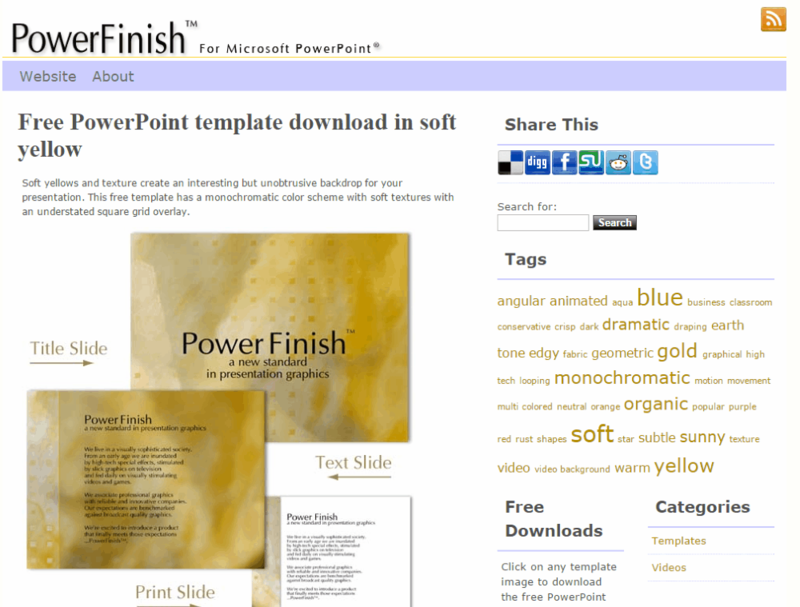 PowerFinish is a simple, and beautiful website where you can choose the option to download from a number of templates available. There are a number of templates available to choose from, and you have to just click on the image in order to download the template file. Then you are provided with the option to use it anywhere as per your requirement. The templates are classified in different tags, and you can easily click on the tags to browse to the desired template easily, so as to suit your required needs. MedicinePPT provides a number of free medical PowerPoint templates for free, and is completely dedicated to providing medical templates. Here you have to simply browse to the website, and choose the template that suits your needs. You can also browse the templates by categories. 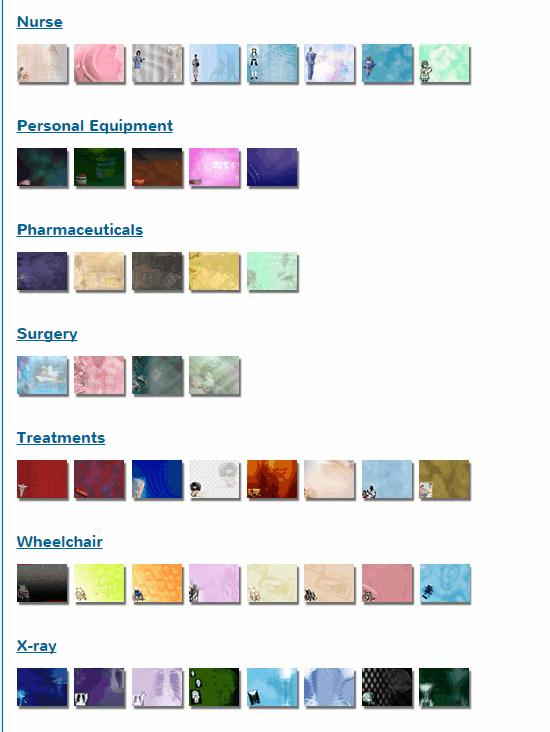 Different categories of templates are available, like: alternative treatment, ambulance, anatomy, blood, biochemistry, body systems, diseases and conditions, DNA, doctors, fracture, genetics, health sciences, hospital, injury, medicine, medical and lab equipment, medical professions, medical symbols, medicinal plants, nurse, personal equipment, pharmaceuticals, surgery, treatments, wheel chair, and X-Ray. 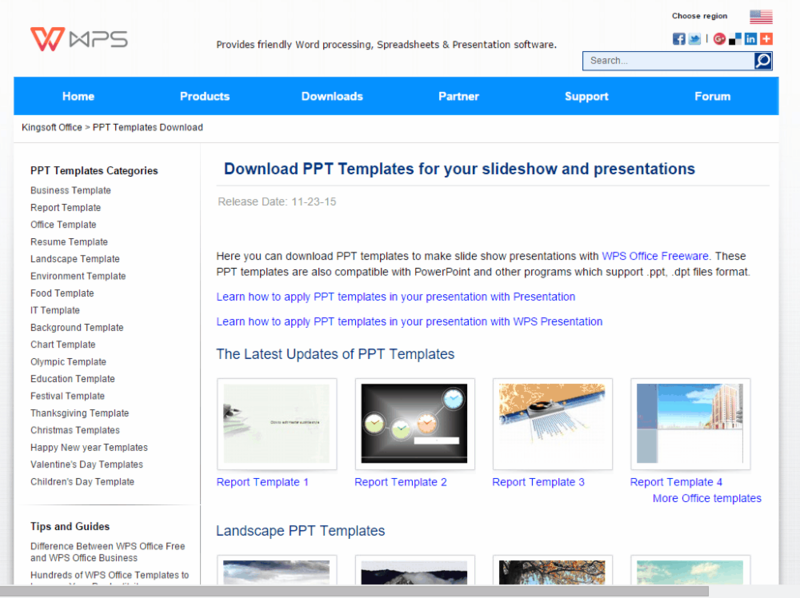 fppt.com is a simple website from where you can download a number of PowerPoint templates. 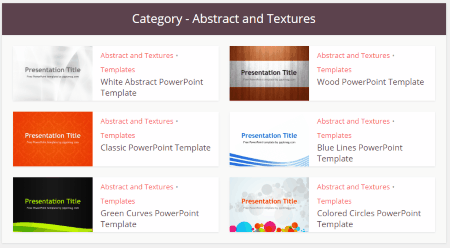 Different free PowerPoint template categories are available to choose from like business PowerPoint templates, medical PowerPoint templates, education PowerPoint templates, nature PowerPoint templates, abstract PowerPoint templates, religious PowerPoint templates, and many more. You can also browse for the top rated templates. The filtering of themes can be done as per the categories, tags, and colors. 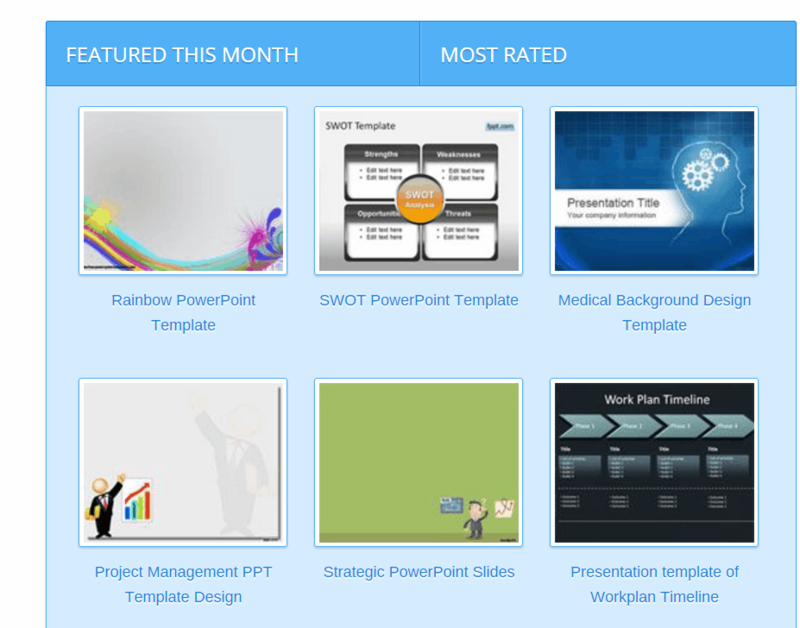 You are also shown the related PowerPoint templates, and most rated PowerPoint templates under a particular category. 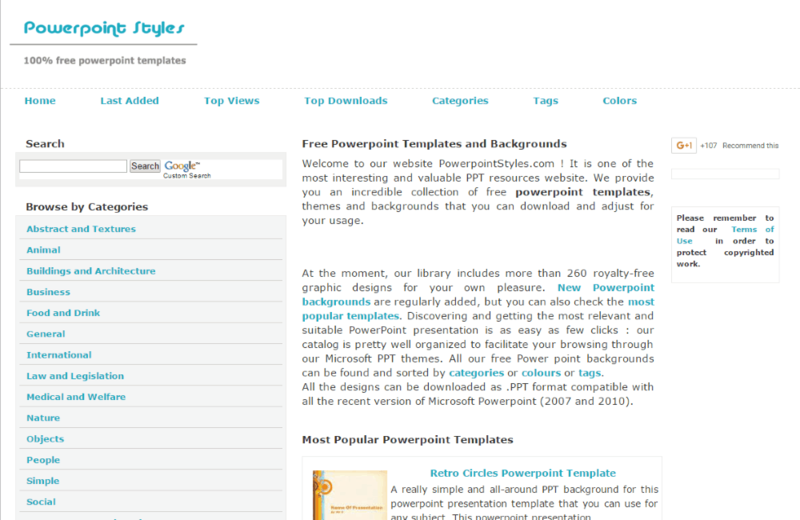 PowerPoint Styles is a simple website that features a number of templates for free. Simply select the template that you want to download, after which you have to click on the download button. 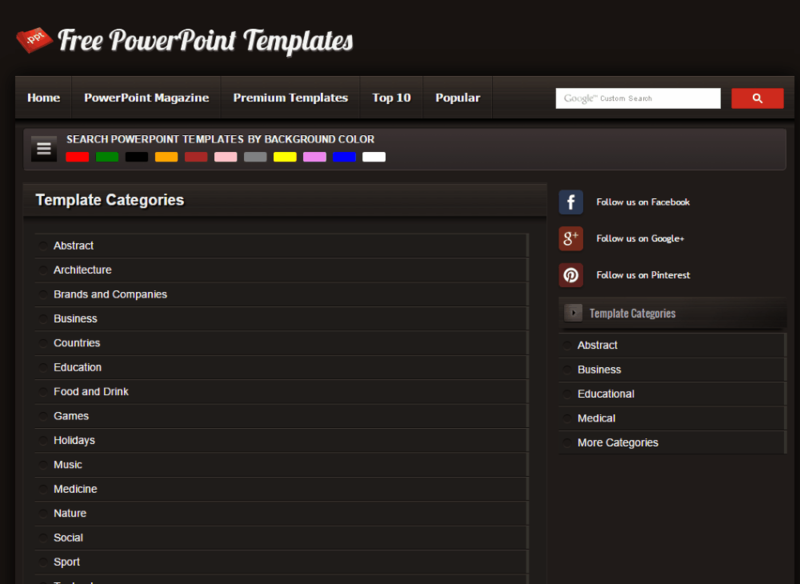 You can browse for the templates based on the last added, top views, top downloads, categories, tags, and colors. Different categories include abstract and textures, animal, buildings and architecture, business, food and drink, general, international, law and legislation, medical and welfare, nature, objects, people, simple, social, sports, games, music, technology and computers, and transportation. 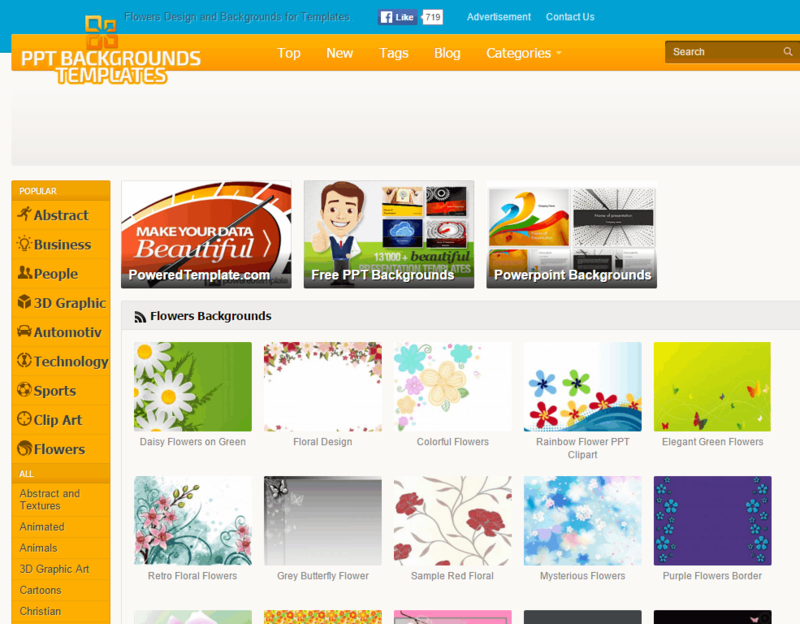 KINGSOFT website lets you download various categories of templates. The different categories are: business, report, office, resume, landscape, environment, food, IT, background, chart, Olympic, education, festival, thanksgiving, Christmas, happy new year, valentine's day, and children's day. The templates are available in two different formats, i.e. DPT, and PPT. So it is quite necessary to check out the file extension before you download to be used in the respective format. The DPT file format works in WPS Office Suite, while PPT works in Microsoft PowerPoint, and OpenOffice Impress. 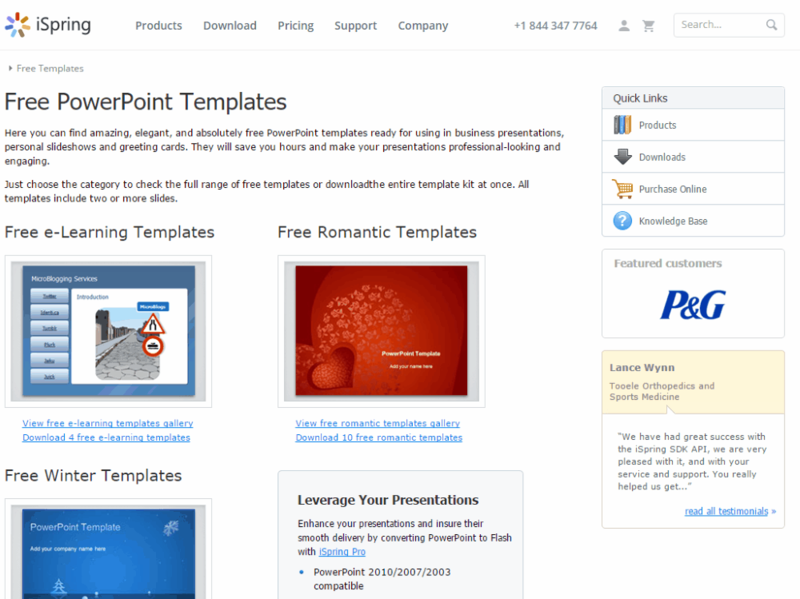 LEAWO is a very simple website that lets you download PowerPoint templates for free. In order to do that you have to simply browse to the website and then download the template that suits you the most. You can browse a number of templates like abstract, April fools' day, basketball/NBA stars, birthday, business, Disney, education, finance, holidays, labor day, medical, mother's day, soccer/football, summer, technology, UEFA, wedding, Christmas, Easter, father's day, Halloween, IT, London Olympics, Michael Jackson, religious, scenery, sports, thanksgiving, training, and valentine. 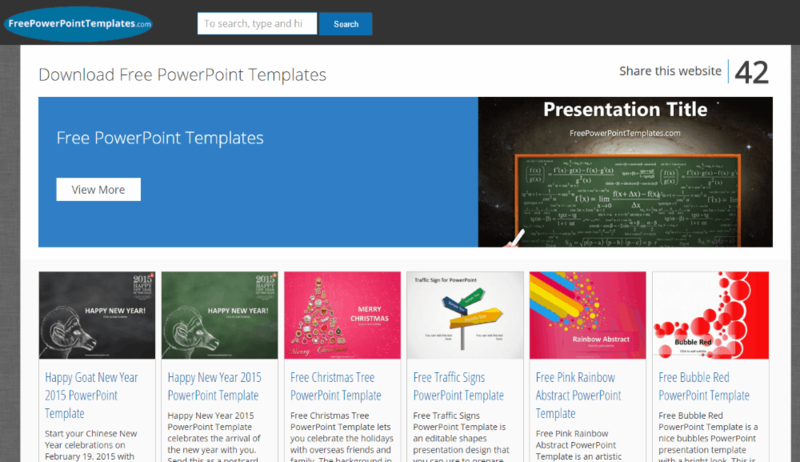 pt powered template is a simple website which lets you download PowerPoint templates for free. The templates are offered in three different packages, i.e. single template, template with subscription, and template with additional slides. 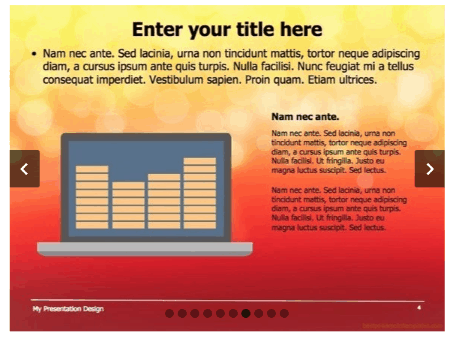 Some of the templates offer single template as free. It has three master slides: Title master, Slide Master, and print master. Templates are available in different categories, like: 3D, abstract, texture, art, animals, pets, agriculture, computers, religious, spiritual, flags, international, education, nature, environment, holiday, medical, and many more. 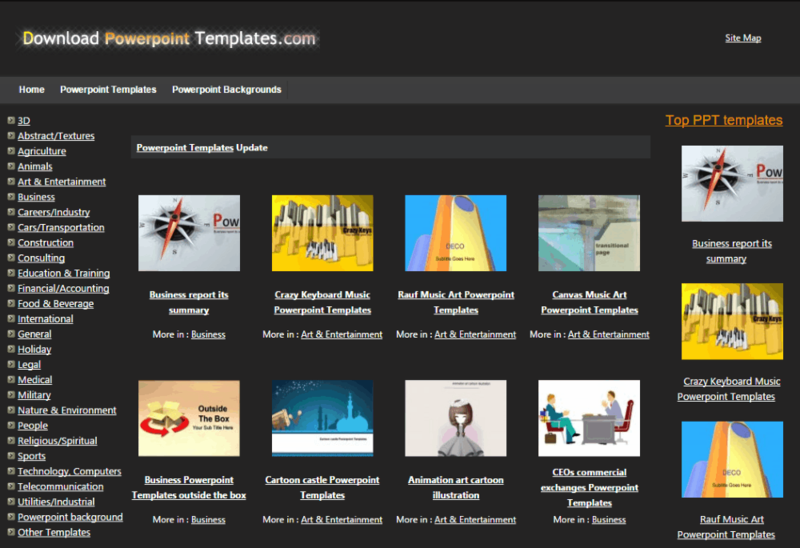 BestPowerpoint Templates is a simple website that lets you download PowerPoint templates for free. 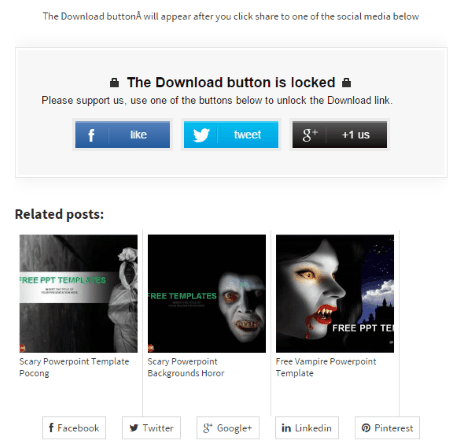 Here you have to simply browse the template, and then choose the option to like on Facebook, Tweet it, or +1 it on Google+ to unlock the download button. The templates are classified under different categories, like: abstract, business, creative, education, mystical, nature, simple, technology, animated, redesign, and resource. These can also be sorted by using color tags. You can also look for the most popular templates. 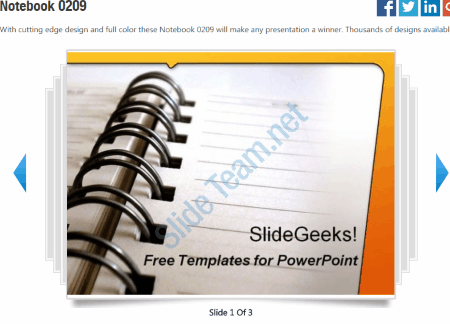 Slide Team is a very simple website where you can choose the option to download PowerPoint templates. In order to do so you have to register on the website first. Then after you can choose the option to download a particular template. You need to share it on Facebook, Twitter, Google+ in order to activate the download button. You can choose from a number of categories, and subcategories available, like abstract, advertising, Africa, agriculture, beach, business, animals, architecture, Christmas, and many more. 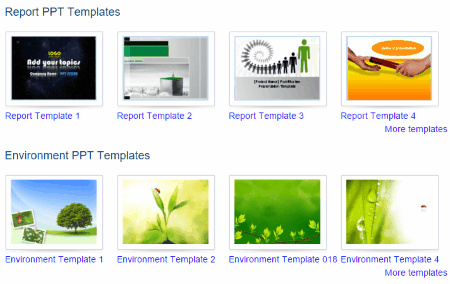 PPT BACKGROUNDS TEMPLATES is a simple website that lets you download a number of PowerPoint templates for free. The templates can be viewed as per the top downloads, new uploads, tags, and categories. Some of the most popular categories are: Abstract and Textures, Animated, Animals, 3D Graphic Art, Cartoons, Christian, Business and Finance, Border and Frame, Transportation, Clip Art, Education, Flags, Flowers, Foods Drinks, Holidays, Medical & Health, Miscellaneous, Music, Nature, Sports, Technology, General, Christmas, Gradient, Love, Lines, Organic, and Celebrities. 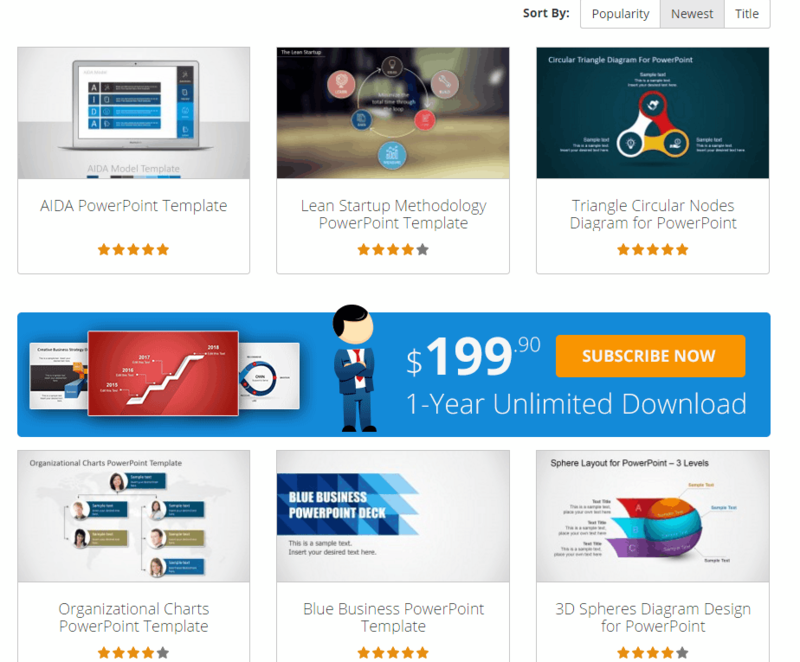 Slide HUNTER is a simple website which features a number of free PowerPoint templates. But in order to download these you need to login to the website first. Then you can browse through the templates, and then choose the option to download the template, whichever suits you the best. You can also search for the templates. You can also browse by choosing popular topics, like: abstract, cycle, arrows, 3D, business, corporate, planning, curves, marketing, strategy, timeline, process, education, and charts. 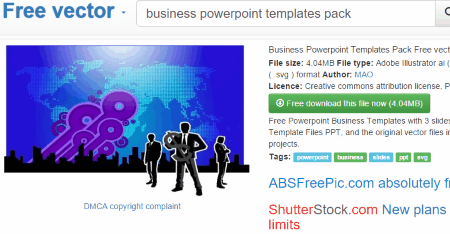 FreePPT Templates is a simple website which contains a number of free PowerPoint templates. 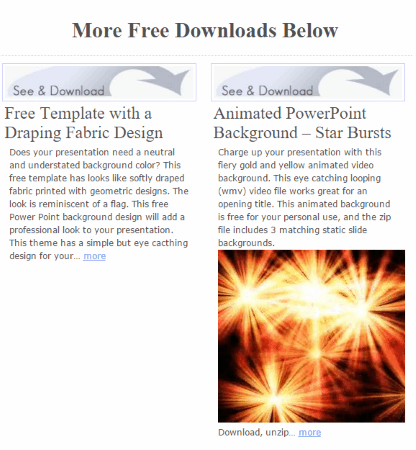 Here you have to simply browse to the website where a number of free PowerPoint templates are available. You can simply download the templates, and put it to use as and when required. 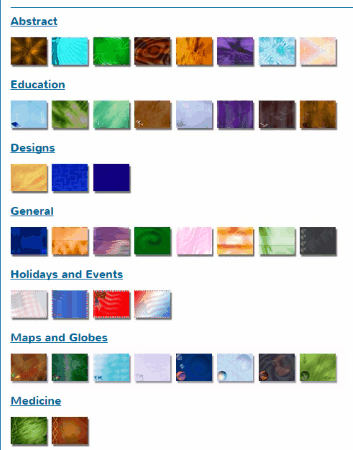 The templates can be browsed by categories, or color. Different categories of template are available, like: abstract, education, designs, general, holidays and events, maps and globes, medicine, nature, patterns, shapes, and textures. 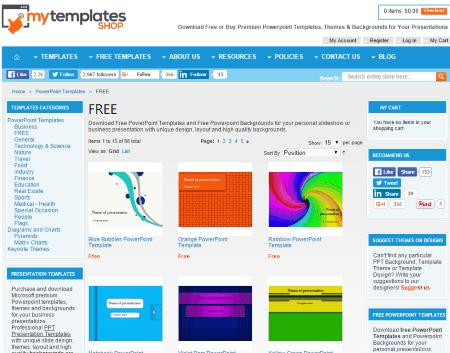 mytemplates SHOP is a very simple website which lets you download templates for free, but some of them are paid. Here you are provided the option to download in 2 different versions, i.e. PPT 2007-2010, and PPT 1997-2003. The templates are further organized in numerous categories, i.e. business, general, technology and science, nature, travel, food, industry, finance, education, real estate, sports, medical and health, special occasion, people, flags, diagrams and charts, pyramids, matrix charts, and many more. 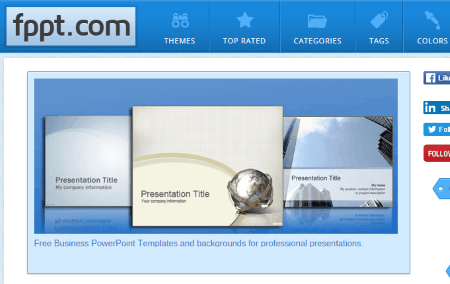 Professional Powerpoint is a simple website which offers a number of PowerPoint templates for free. But the download link for these templates are disabled by default. So in order to activate it you have to share it on Facebook, Twitter, and Google+. Then the download link appears and you can then choose the option to download it. The templates are classified in several categories, like: nature, ethnic, business, education, food, art, technology, scary, medical, and resume. 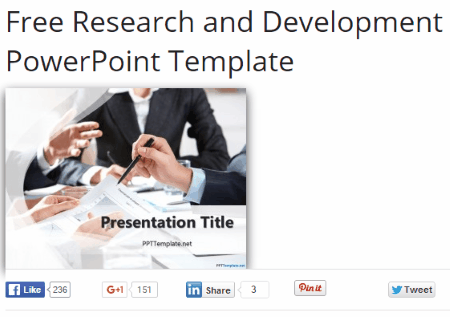 Download PowerPoint Templates.com is a simple website where you have the option to download templates from the website. There are a number of categories of templates, which can be downloaded, like: 3D, abstract, textures, agriculture, animals, art and entertainment, business, careers, industry, cars, transportation, construction, consulting, education and training, financial, accounting, food and beverage, international, general, holiday, legal, medical, military, nature and environment, people, religious, spiritual, sports, technology, computers, telecommunication, utilities, industrial, and many more. 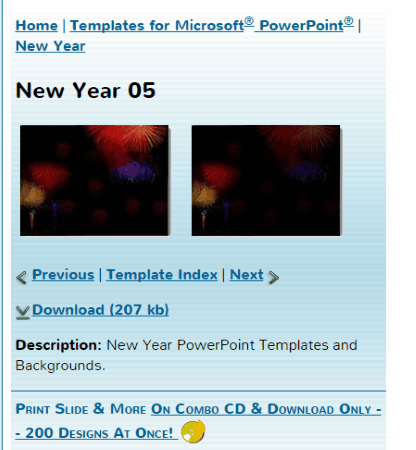 MoyeaSoft PowerPoint to DVD is a website that offers you some PowerPoint templates for free download. It offers PowerPoint templates in a number of different categories, like: Business, Education, Training, Technology, Finance, Holiday, Christmas, PowerPoint Backgrounds, abstract, April fools' day, basketball/NBA stars, birthday, business, Disney, education, finance, holidays, labor day, medical, mother's day, soccer/football, summer, technology, UEFA, wedding, Christmas, Easter, father's day, Halloween, IT, London Olympics, Michael Jackson, religious, scenery, sports, thanksgiving, training, and valentine. 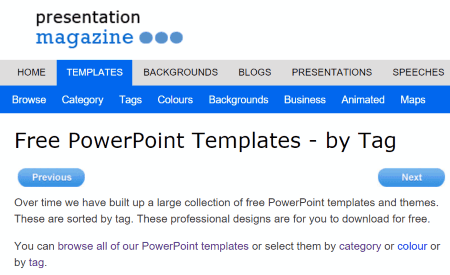 ALLPPT.com is a simple website with a number of free PowerPoint template online. There are a number of template categories available, like: business, computer, education, abstract, medical, nature, finance, food, real estate, religion, industry, sport, and registration. These are available in two different layout, i.e. Widescreen, and standard. You can choose any format template that suits you. 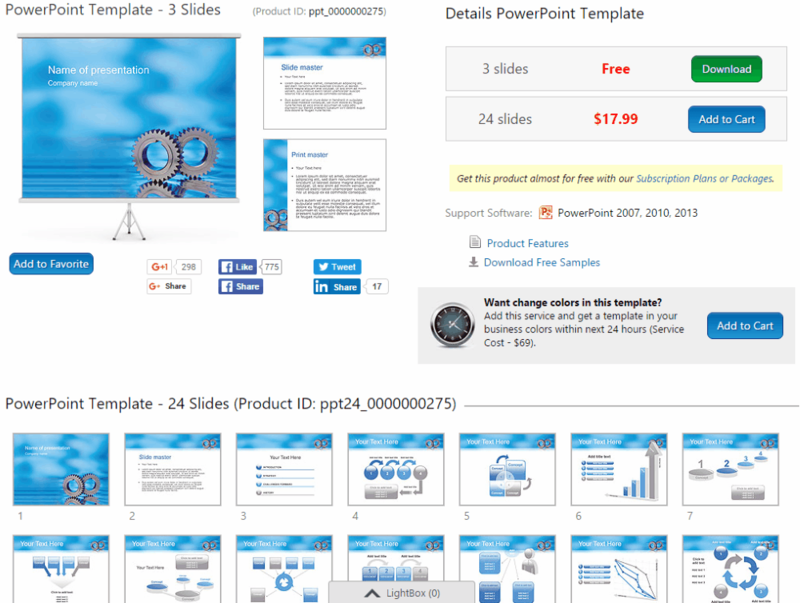 It also contains some of the PowerPoint templates, PowerPoint diagrams, and PowerPoint charts, and graphics. 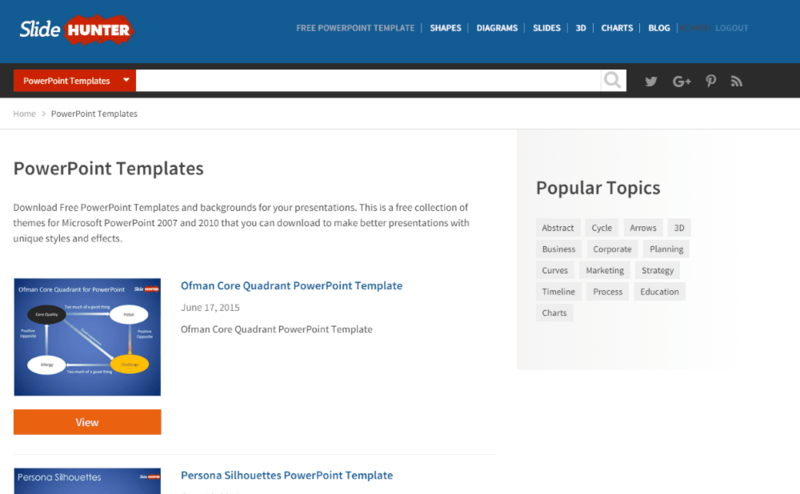 FreePowerPointTemplates.com is a website that lets you download PowerPoint templates for free. Here after you choose the option to download the template you have to either share the link on Facebook, Twitter, or Google+ in order to activate the download link. After the download link is activated you can easily choose the option to download the template and use it. It features a number of templates of different categories. 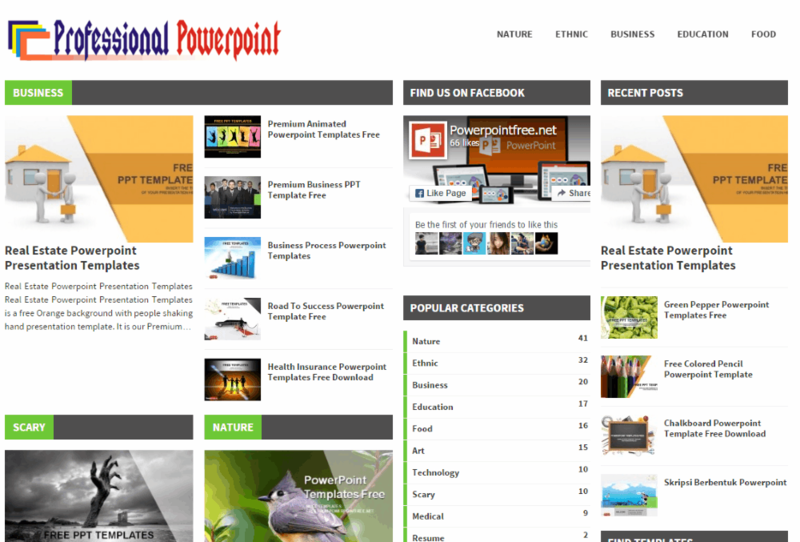 presentation magazine is a website that covers a number of presentation related topics. Along with it, it also features thousands of free templates, and backgrounds on its website. You can download the themes for free. 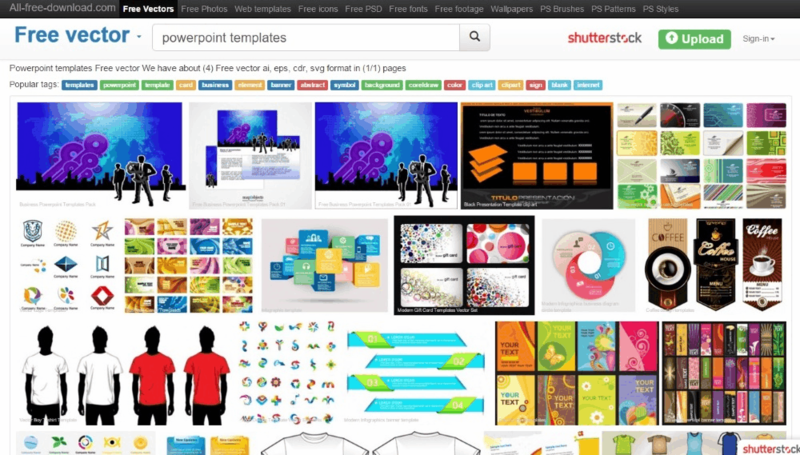 You can browse for the templates, based on category, tags, colors, business, animated, maps, and medical. The templates are categorized under different categories, like: business, medical, seasonal, birthday, Christmas, and many more. 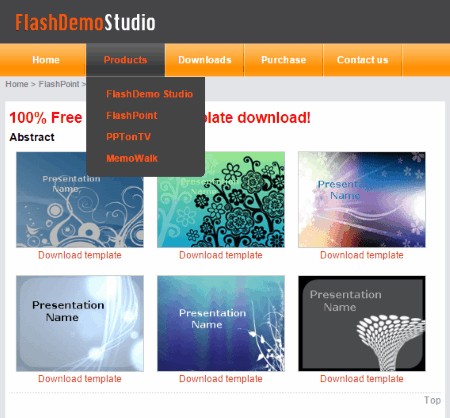 FlashDemo Studio is a simple website where you can easily download the PowerPoint templates. Here you have to simply browse to the website and choose the option to download the template that suits you the best. The templates are beautifully arranged in different categories, like: abstract, business, education, general, and nature. The templates are downloaded in POT format, and can be further put to use. 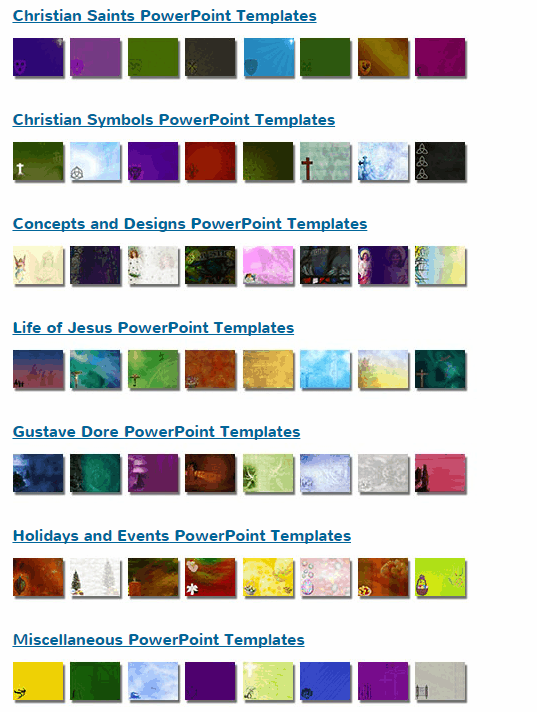 ChristianPPT is a simple website where you can find a number of free templates related to Christianity. The templates are classified under different categories so as to suit your needs. Some of the categories are: Bible and holy books, cemetery, christian art, church, christian saints, christian symbols, concepts and design, life of Jesus, Gustave Dore, holidays and events, miscellaneous, pattern, and worship. 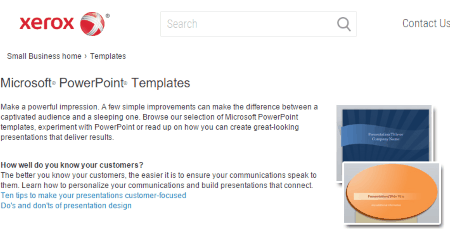 INDEZINE is a very simple website that lets you download PowerPoint templates. Some of these are free, while others are to be brought. The PowerPoint templates are classified in different categories, like: party, marketing, communication, infrastructure, Christmas, new year, and many more. You can also search for the templates based on color. 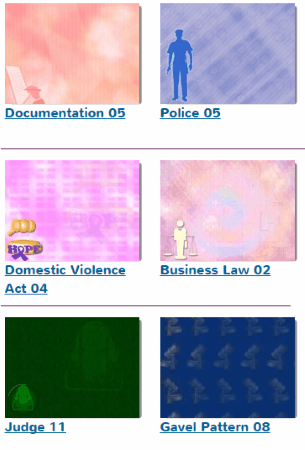 It also contains a number of PowerPoint backgrounds. 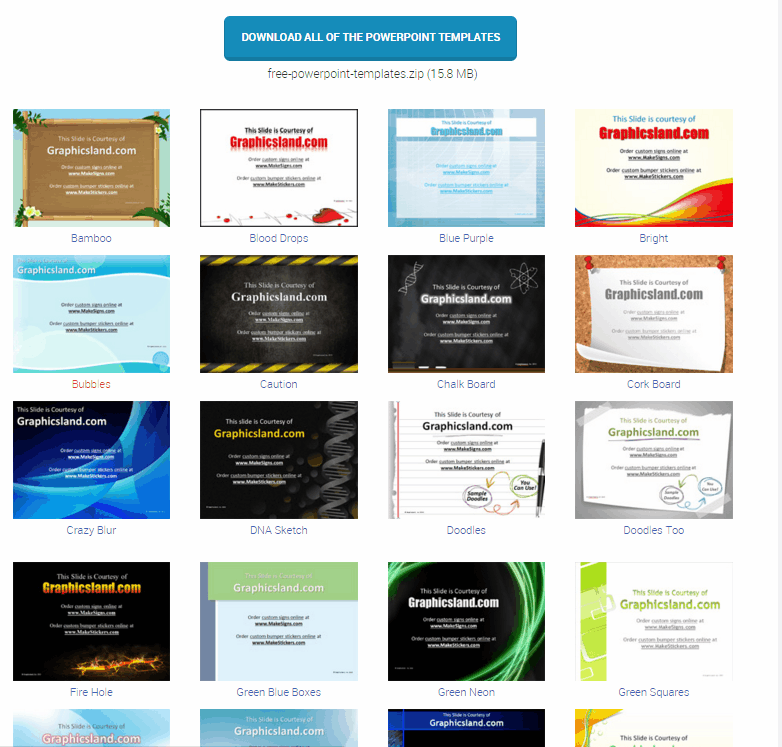 PosterPresentations.com is a good website where you can download some basic PowerPoint poster templates. 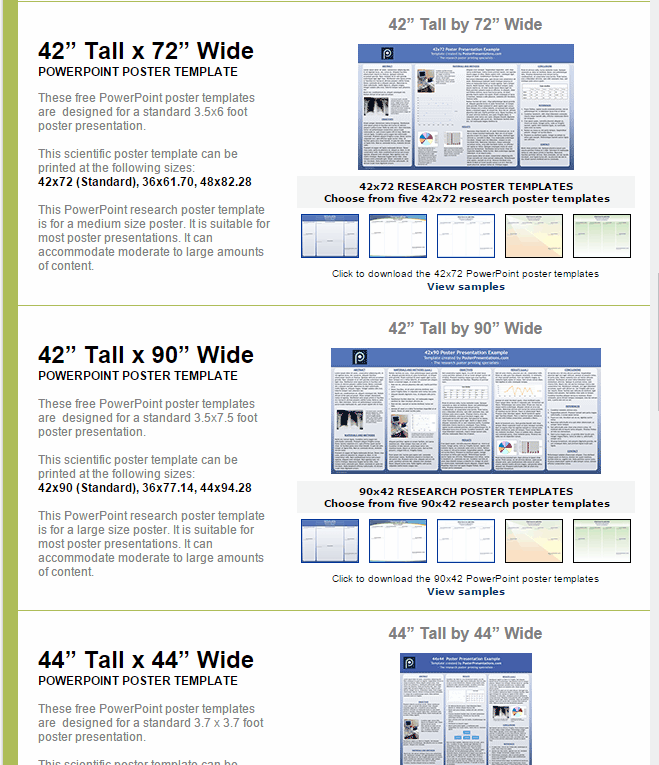 Here research templates are available in different sizes to choose from, some of that being: 36"*48",36"*48" (trifold), 36"*56", 36"*60", 36"*72", 36"*96", 42"*60", 42"*72", 42"*90", 44"*44", 48"*72", 48"*48", 48"*96", 40"*30", 91"*122", 70"*100", 100"*140", 1 metre * 1 metre, 100 cm * 200 cm, A0, A1, and A3. 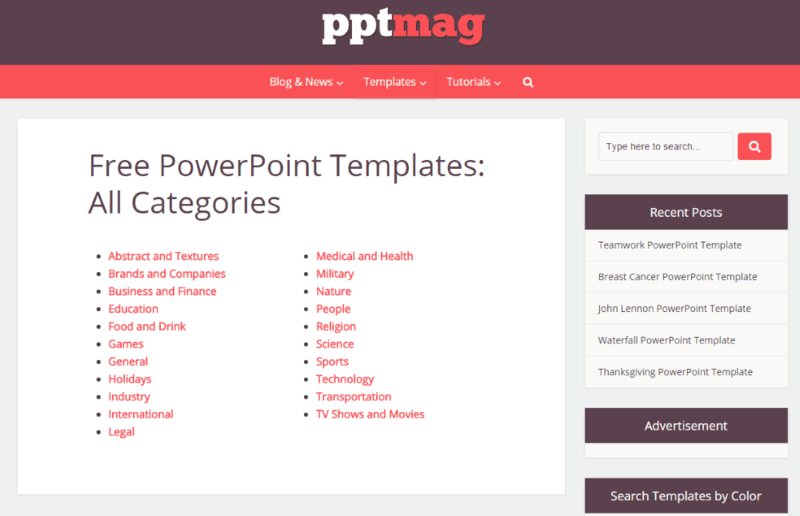 pptmag is a simple website dedicated to PowerPoint themes, news, presentation skills, and ideas and tips. 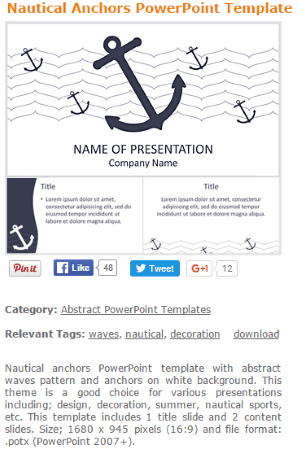 The PowerPoint templates are classified under different categories, like: abstract and textures, brands and companies, business and finance, education, food and drink, games, general, holidays, industry, industry, international, legal, medical and health, military, nature, people, religion, science, sports, technology, transportation, TV shows and movies. 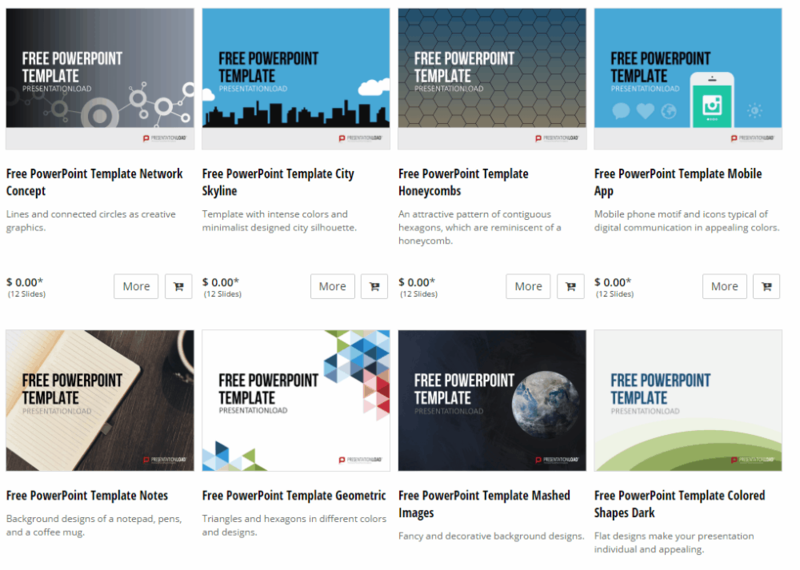 All-free-download.com offers a number of free PowerPoint template files for free. Here you can download a number of template files for free. The downloaded ZIP file contains JPEG files, AI files, EPS, SVG, and PPT files. The templates are classified in different categories, some of them being card, business, element, banner, abstract, symbol, background, color, clip-art, sign, and internet. 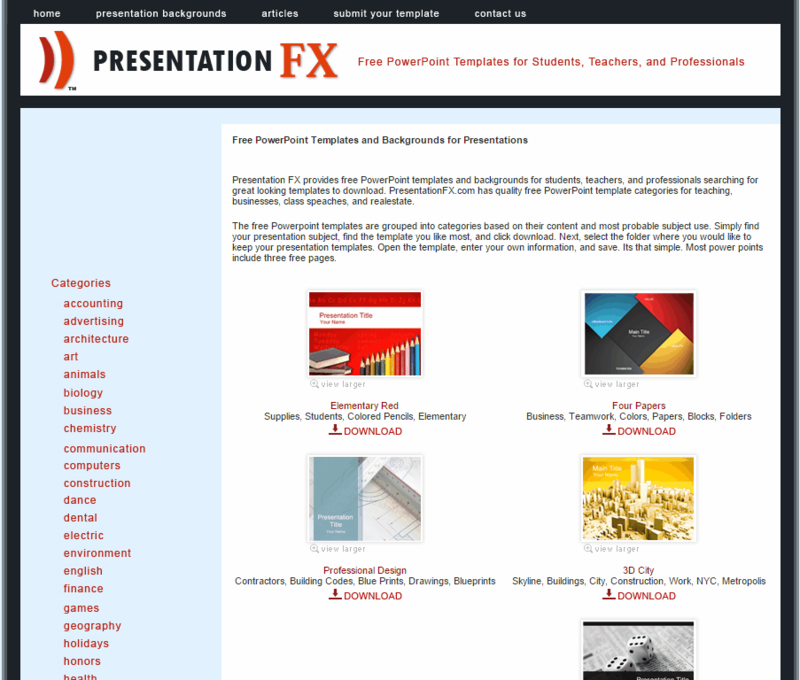 PRESENTATION FX is another website to download ppt templates free. The templates are beautifully classified in different categories, like: accounting, advertising, architecture, art, animals, biology, business, chemistry, communication, computers, construction, dance, dental, electric, environment, english, finance, games, geography, holidays, honors, health, history, math, medical, music, physics, poetry, real estate, religion, sports, teaching, telecommunication, and writing. 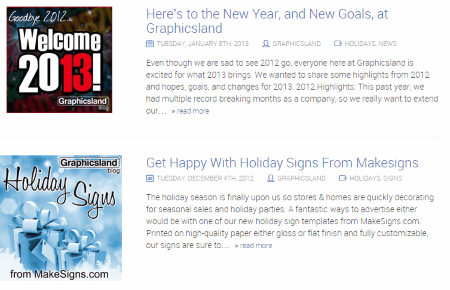 Graphicsland is a simple website that lets you download templates. 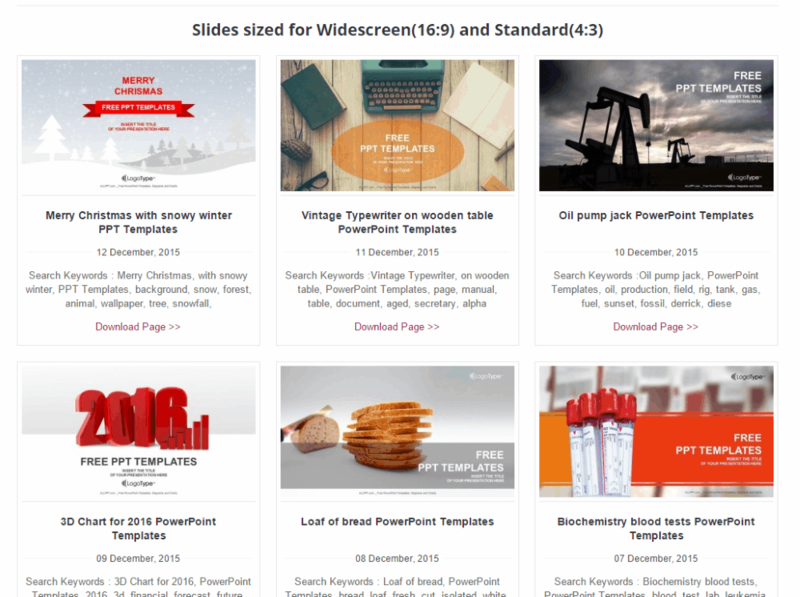 Here you are provided with the option to download either all of the free PowerPoint files in one or download the template that you like the most. Different template categories that are available are bumper stickers, holidays, news, press releases, scientific, and many more. 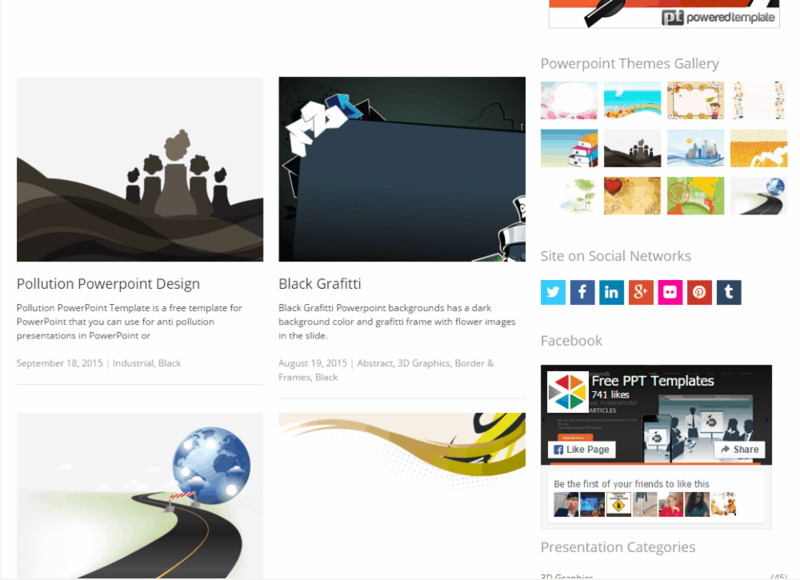 iSpring is a beautiful website that offers different PowerPoint templates to download for free. 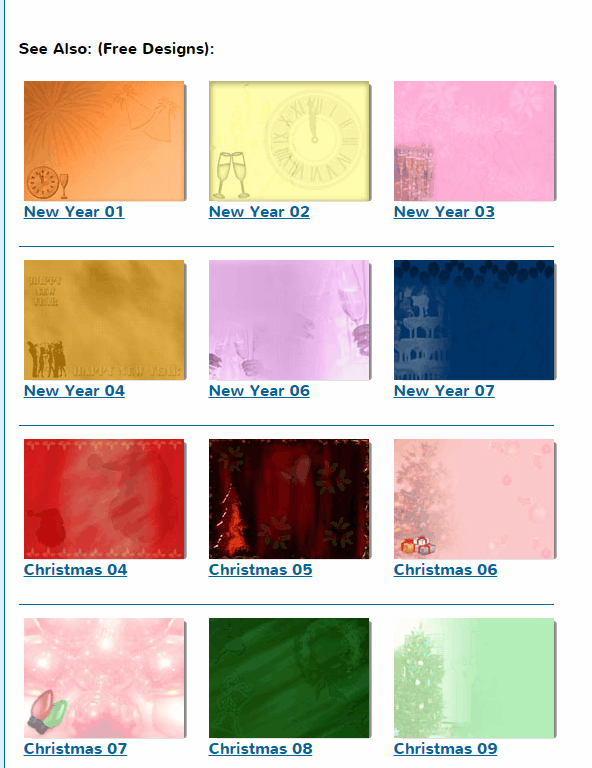 It offers templates in different categories, like: e-Learning, romantic, greetings, and winter. 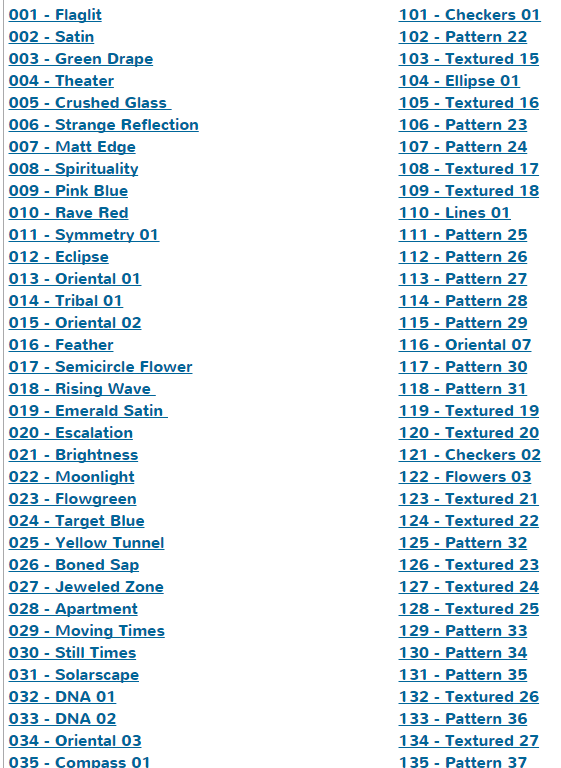 The whole compilation of the template set can be downloaded all at once, or downloaded as single files. 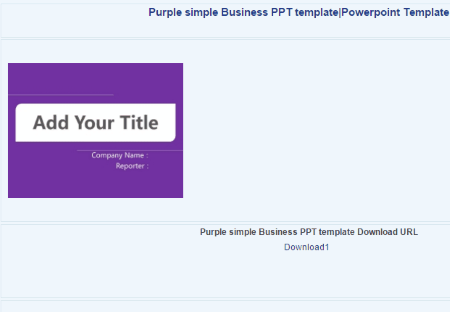 The templates can be downloaded as either PPTX, or PPT. 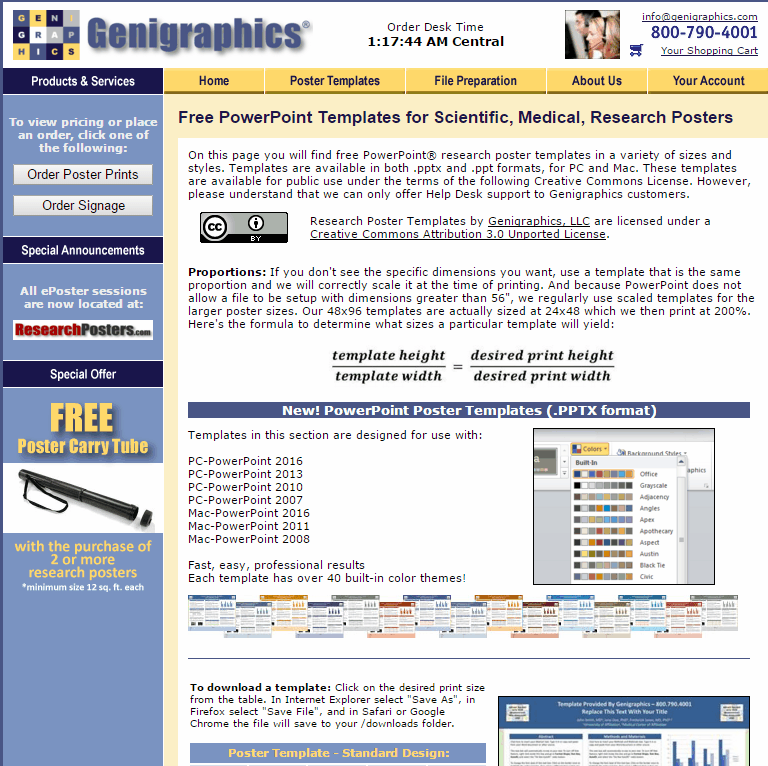 Genigraphics is a simple website that offers a number of PowerPoint templates for free. 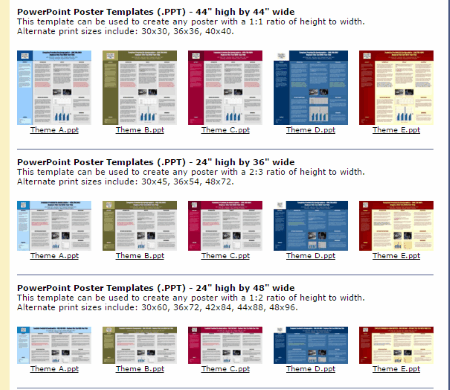 Then you can select different Poster templates of different sizes. On downloading poster sizes of differnt dimension, like: 24x24, 30x30, 36x36, 42x42, 44x44, 24x36, 30x40, 36x48, 42x56, 24x48, 30x60, 36x56, 42x60, 48x48, 36x60, 42x72, 48x72, 36x72, A0, and A1. 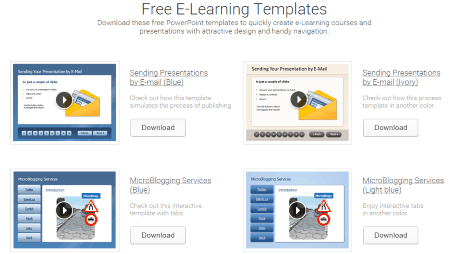 E-Learning Heroes is a simple website that lets you download PowerPoint templates for free, but in order to do so you have to login to the website first. 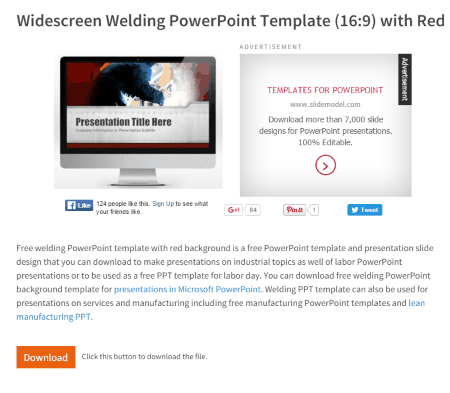 Then you can browse any PowerPoint template, and use it anywhere for free. 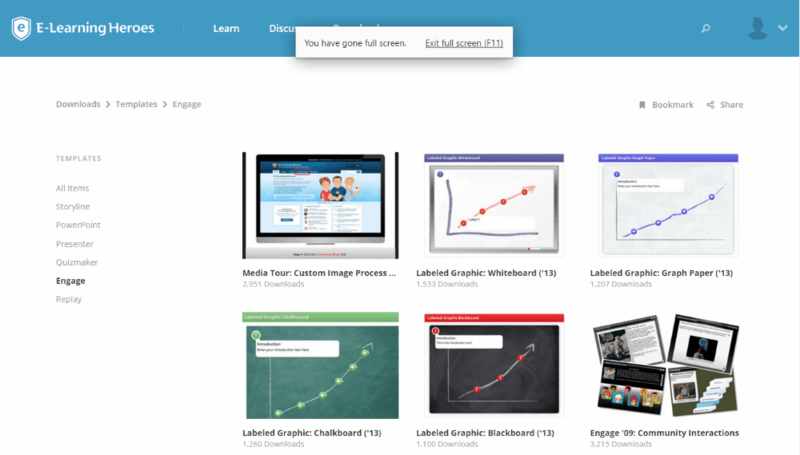 It offers different items like storyline, presenter, quizmaker, engage, and replay. 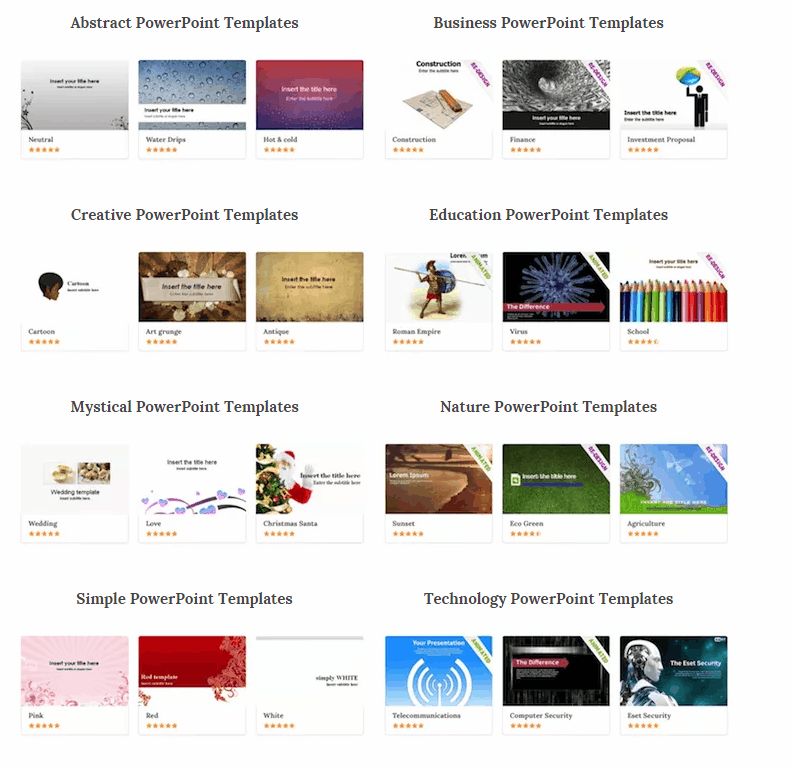 Brainy Betty is a very simple website which offers you a number of PowerPoint templates for free. 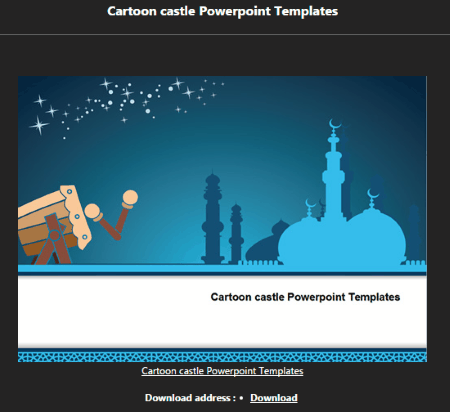 The templates include the animated images, and music for presentations. 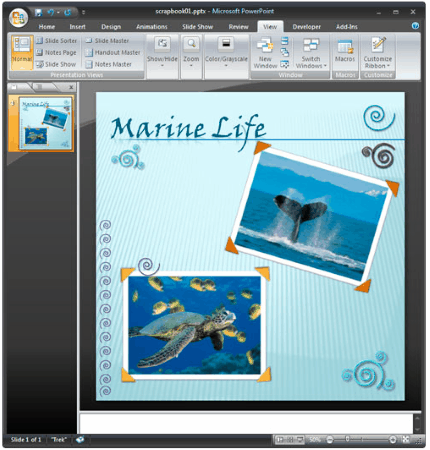 It also features a number of objects, background images, music files, and many more such items that can be included into the PowerPoint. 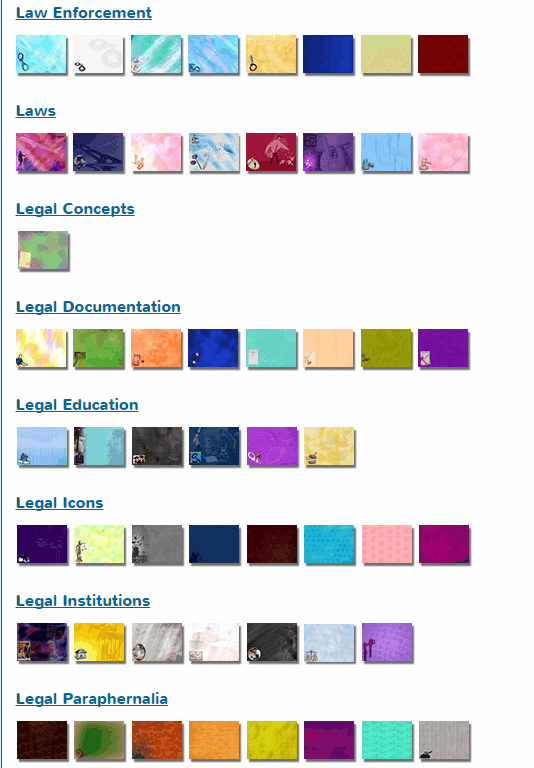 LegalPPT is a website that features a number of PowerPoint templates related to legal cases. 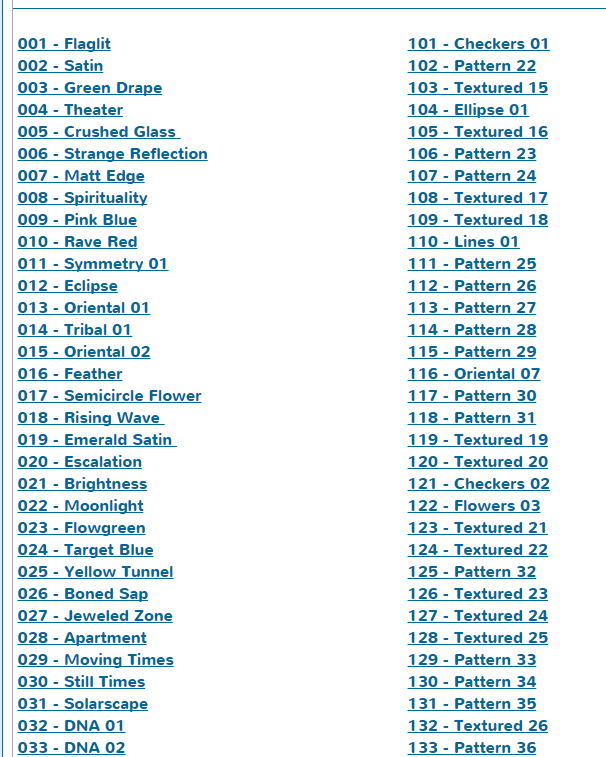 The templates are beautifully categorized into categories, and subcategories. Some of the basic categories are: law enforcement, laws, legal concepts, legal documentation, legal education, legal icons, legal institutions, legal paraphernalia, legal professions, and regulations. 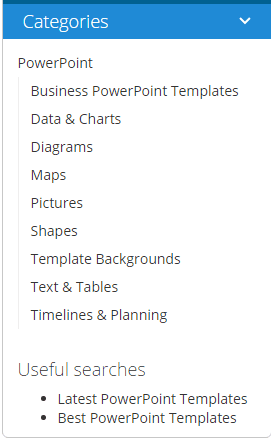 A number of PowerPoint templates and themes are available on the Office.com website which is provided by default by Microsoft. These can be downloaded and put to use. 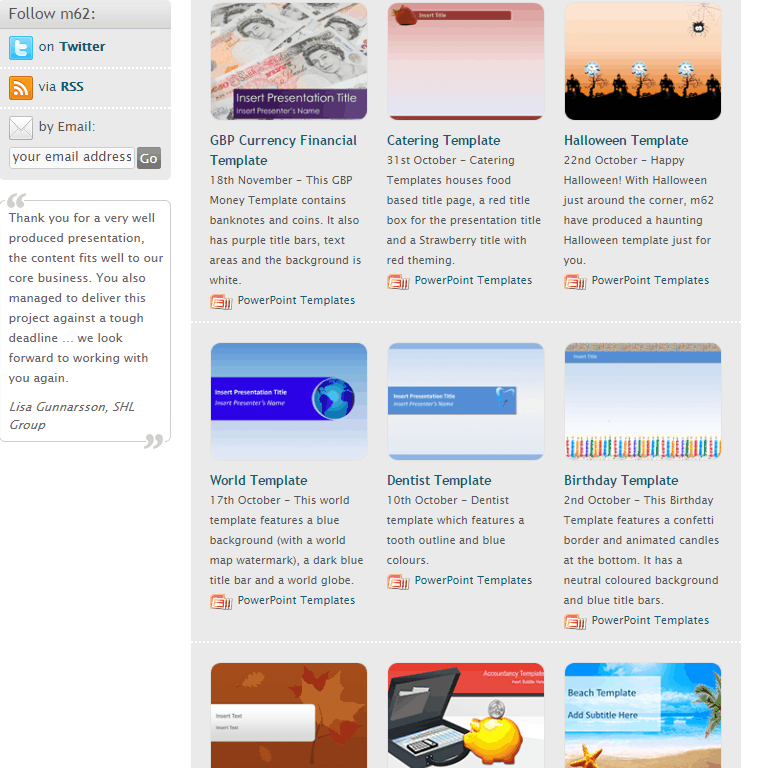 You can also browse the templates based on the categories, like: budget, business, calendar, card, education, and many more. 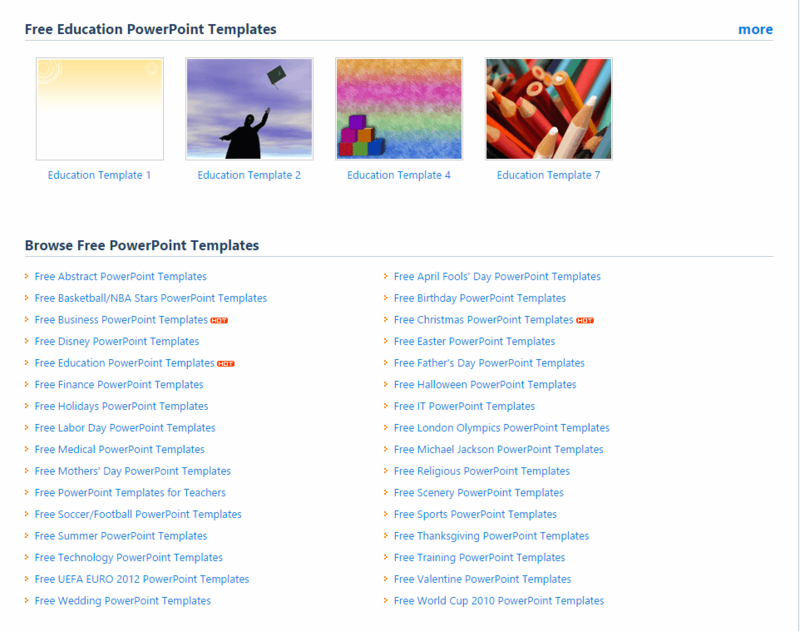 Investintech.com has a list of the PowerPoint templates that are available for free download. You have to just go to the website and download the templates available. These templates are classified in different categories like bars and stripes, grunge, jelly fish, business, industry, and nature. 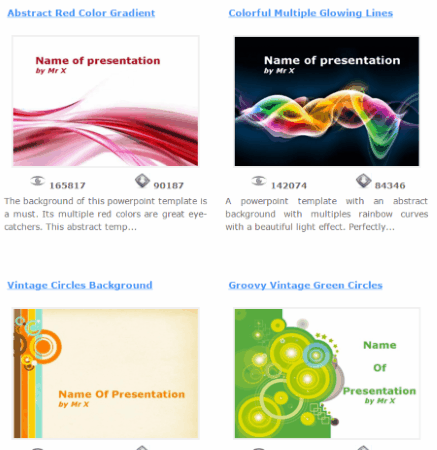 m62 is a simple website from where you can download a number of templates for free. The templates are organized in different categories, like: business, finance, technology, pharmaceutical, medical, education, transport and logistics, travel, retail, industrial, christian, sport and leisure, and abstract. 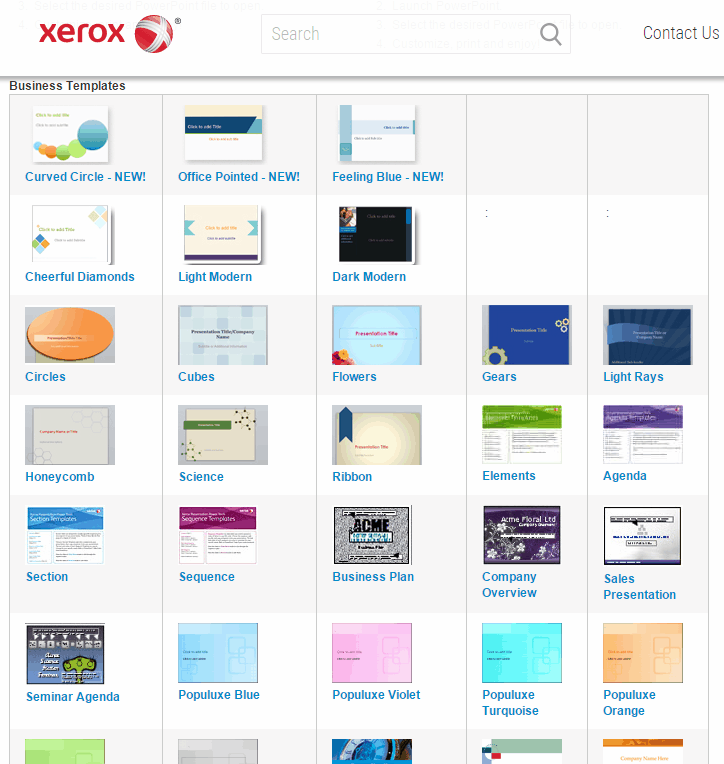 xerox offers a number of free PowerPoint templates that may be put to use after download. It is further classified in different categories, like: business, creative, contemporary, earth, nature, sky, and many more. 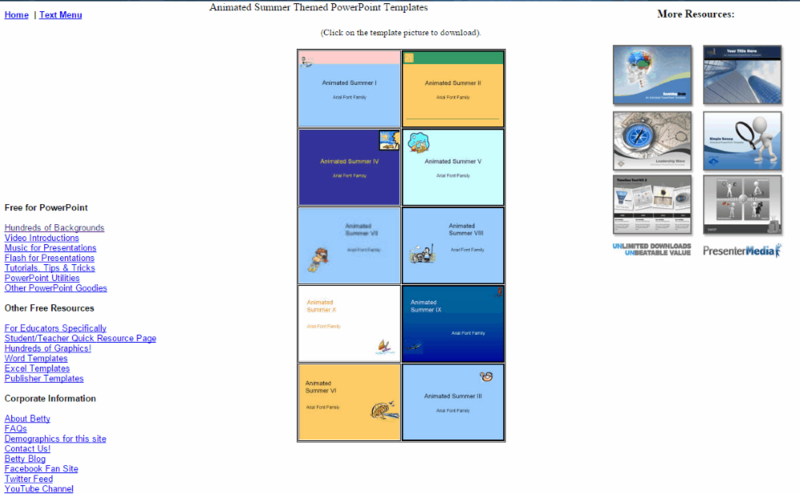 Template.net is a very simple website which features a number of PowerPoint templates for free. Different template categories are available, like: IT, law, auction, environment, transportation, restaurant, spa, and maintenance spas. Scrapbook Presentations is a simple websites that provides you PowerPoint templates for free to download digital scrapbook presentations. 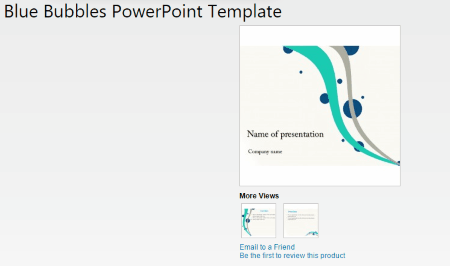 Here a number of PowerPoint templates are available to choose from. 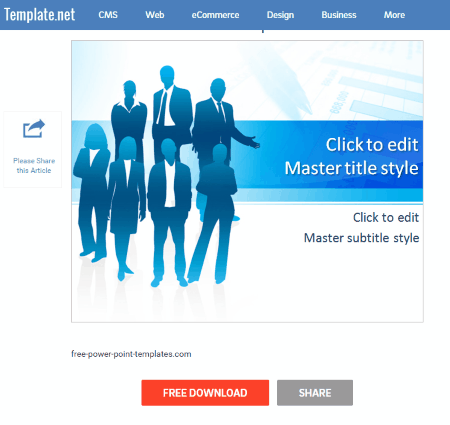 TemplatesWise.com is a very beautiful website which offers free templates to download. The templates are available in different categories, like: abstract, general, business, nature, finance, and travel.